El Best Western The Lairgate Hotel se encuentra en el centro de Beverley. Venga y disfrute de las mejores atracciónes turísticas cerca de nuestro hotel. Precios bajos garantizados y ofertas exclusivas. Beverley es una emblemática joya arquitectónica donde se pueden encontrar tesoros medievales tan fabulosos como St. Mary's, la Catedral de Beverley Minster o incluso uno de los mejores pórticos georgianos de Yorkshire. Ubicado en el centro de esta hermosa ciudad mercado y en el mismo corazón de su carácter acogedor, el Best Western® Lairgate Hotel ofrece con orgullo un marcado carácter, al que contribuyen tanto su personal como sus instalaciones, y que permitirá a los huéspedes disfrutar de los estándares de mayor nivel en cada palmo del hotel. Recientemente renovado tras un completo proceso de ampliación y reformas, este hotel ofrece una recoleta zona de patio en su zona posterior y un espacio para tomar el sol los días de buen tiempo. Tras un día de compras, visitas a enclaves de interés o a las onduladas colinas de la zona próxima al hotel, aquí encontrará el espacio idóneo para pasar unos momentos de calidad en compañía. Disfrute de su estancia en nuestro hotel. We stayed here with some friends for one night. Staff are friendly, helpful and efficient. Comfortable beds, clean rooms and bathrooms. Breakfast choice was good and food was well cooked. Small car park which is allocated on a first come first served basis. The hotel could do with a bit of updating, but apart from that, no negative aspects. It's more or less in the town centre so very handy for shops, bars, restaurants. Stayed here for 1 night with my partner and another couple. The hotel was in a great spot right in the centre of town, lovely old building and very spacious rooms. We had no shower but a long bath which i preferred. It was clean and airy and the bed was comfortable. We had the room right at the top so lots of stairs to climb. The tv did not work in the room but no other complaints. The decor needs abit of an update, the bar area was crowded with sofas and big arm chairs, slightly resembling and old people's home. The staff were friendly and and the price was good. The town is beautiful and well worth a visit. We will be returning again in the summer. Wonderful hotel right in town center, with parking. Comfortable warm rooms with lovely beds. Staff can't do enough to make you feel at home nothing is too much trouble. Highly recommended for both lone travellers and couples. 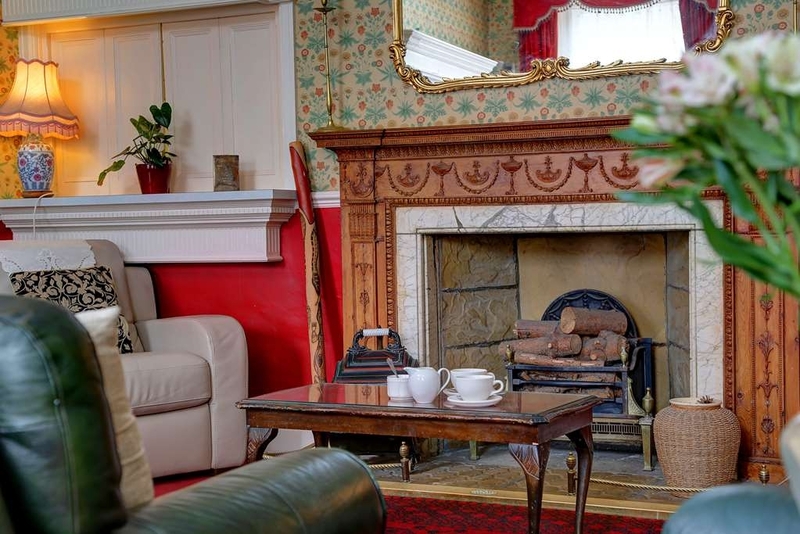 "Excellent value for money with great breakfast"
The Lairgate is a lovely old style hotel, you know the type which has wooden panels on some walls and some sloping floors. I love things like this, it all adds to the quaintness and character of the place. I got the impression that most of the guests that stay here are of a certain age (like retired !) so its not a lively hotel, which is probably what most people visiting Beverley expect anyway. The bar on an evening was deserted, we were the only ones who used it for a last drink, so not particularly atmospheric. The breakfast was excellent; I loved that they had grapefruit juice as well as the usual standard orange juice that most hotels put out. The location is also great, just 2 mins walk from the central market square, not that Beverley is particularly big, you can walk round the whole town in approximately an hour. Only one minor grumble, the WiFi was so slow or wouldn't connect that it was virtually unusable. For the price we paid for our room with breakfast included this hotel represents excellent value. Would not hesitate to stay here again or recommend it to others. We stayed two nights at this Hotel. It's cozy and the breakfast is good. Unfortunately, my Sony camera with a quite expensive lens disappeared from the room. The staff said they would check with the personnel but as you can imagine they didn't find the camera. I would suggest you do not leave your valuable belongings in the room. There is no safe. I stayed here while visiting friends in Beverley for 2 nights. From the reception to the bar to the check out, everything was handled professionally and efficiently. My room was spacious, very clean and more importantly quiet! Can't recommend this hotel enough. The room was spacious and well furnished with a comfortable king sized bed. We were greeted promptly on arrival by a very welcoming member of staff. Throughout our stay all staff were courteous and friendly. The location was ideal, very close to the main square and near restaurants and bars. My impression on arrival was very good. The ground floor had been nicely refurbished and was bright and very festive. The staff member who checked me in carried my case upstairs, for which I was thankful. My room, no. 16 was obviously waiting refurbishment, it was very tired. Having said that, it was clean and the bed very comfy. Overall reasonable value for money. "Time hasn't been kind - poor hotel and poor service"
Stayed for one night after a day of Christmas shopping in York. The hotel itself is looking tired and hasn't benefited from from being owned by Best Western. My wife and I stayed in an extension room right next door to the car park where cigarette smokers congregated during their Christmas do's. The hotel was full but understaffed and therefore breakfast was slow, service poor and breakfast cold - a number of other tables complained as well as us. Won't be staying again. First time I have stayed here literally a three minute walk from the Market Square and the shops. Beverly Minster is a must.. We had a large bedroom with victorian furniture may not be everyone's choice. Comfortable bed. TV and coffee facilities, hairdryer, iron, ironing board, toiletries. Nice range of breakfast choices. We were on the first floor so there was a staircase to climb with our suitcases. It is an old hotel with a lounge/bar with coffee facilities in the hallway. Car park at the rear of the hotel (no charge).The rear of the hotel us on a busy one way road so it could be noisy. Good value for money and yes I would stay there again as it is handy for the shops. "Very relaxing and welcoming short stay"
Some complain that the Lairgate is a little quaint, old-fashioned or whatever, but for us it was relaxing, comfortable and welcoming. Car park is a bit tight, and some rooms are up around 40 stairs, but the room we had was very quiet, practical with everything working, good large TV - hard to see from one twin bed but comfortable chair made that no problem. Gluten free options available and the staff could not be more welcoming and helpful, meeting requests helpfully and promptly. Prices reasonable. Will stay there again if visiting Beverley. Stayed at this hotel in Beverly in September 2018, and we had a ground floor room at the rear of the property. First of all I had difficulty in locating the hotel even with my SatNav in use. Having gone past it once, I then found on the second pass that the car park is at the rear with its entrance in a different street which would have meant a 3rd drive round to try and find that. I parked in the town centre only a 100 yards or so away, and it is free overnight till 08.00hrs when the town parking fees kick in. It is an old building and yes there are parts that need some TLC, but it was not run down. Our ground floor room was "acceptable" nothing spectacular, with a large bathroom, and large bedroom area as well. The bed was comfortable and we slept well. There is a large bar area which seemed popular but we didnot use it as the town has many pubs and restaurants and we wanted to "walk about" for our one evening stay. The breakfast was good, but it is a served meal and not "buffet style" which we prefer; but no complaints on the quality or the quantity. Down side from our viewpoint is that the window to our bedroom was next to the exterior seating area, and only a net curtain to prevent inquiring looks.... plus the window exterior was surrounded by ivy growth etc, which meant opening a window invited in all the bugs associated with any flora...… We had to keep the window closed and the curtains as well at dark for privacy, not ideal. Have never seen an exterior seating area separated for smoking and non smoking before which seemed off that someone thinks that smoke can be stopped from going wherever it wants outside a building.... mmm Do beware the public parking charge from 08.00hrs, as you might still be eating breakfast..... which was a pain. Beverly is a lovely market town and well worth a visit. "A complete let down "
We went for lunch to this Hotel and were both completely shocked at the ageing decor. We actually live in Beverley and are very proud of our Historic Town. We have stayed in other Best Western Hotels around the Country & they have always been finished to a very high standard. The food was mediocre, had better pub meals in Beverley for less money. We over heard some people who were staying overnight and having a drink on the next table to us. They said it reminded them of a care home & their rooms smelt of wee. Best Western need to get their act together. Looks like the whole place needs refurbishment. Certainly would not recommend staying here. The only good thing it has going for it, is it is centrally located. Such a shame. I recently took a party of my friends for afternoon tea at the Lairgate. We were seated in the lounge a very pleasant room which was already prepared for us. It was cosy and private. The tea was excellent with plenty of choices of sandwiches cakes and scones and plenty of food. We started with a glass of prosecco or sparkling elderflower drinkThere wascthen a choice of tea or coffee. The service from the staff was excellent. All my friends enjoyed the afternoon and commented on how good the venue and tea were. Comfortable lounge in the central location of Beverley. Small friendly hotel. Afternoon tea offer is well worth the money. I go regularly to have the super offer of home made scone jam and cream or toasted teacake and drink for £3. "Like going back in time." Went to the lair gate for afternoon tea. What a truly lovely afternoon, the ambience was lively. Friendly efficient staff, also very courteous, comfortable seating areas, bone china crockery And lovely food. Couldn't have asked for a nicer experience. Friendly staff, comfortable and welcoming room BUT: the mattress was saggy and had loose springs and needed immediate replacement. The bathroom was a disgrace - the bath, basin and WC were clean but the corners of the room and the edges of the tiles were filthy with ground in dirt, I question whether they had ever been cleaned properly. There was no atmosphere in any of the public rooms which were all a little faded. The food was good standard 'pub food', certailnly nowhere near fine dining. "Tired and in need of an upgrade"
Stayed Best Western for a single night over the weekend whilst visiting my son. To be honest the hotel was far from my first choice however that weekend everything else was fully booked. The hotel is in a great location, just off the main square where the market is held on Saturday, so handy for shopping bars and restaurants. Also the staff were very friendly and helpful. Unfortunately that is where the positives end. The hotel is so dated and in desparate need of a full upgrade. Rooms, beds, bathrooms - everything needs doing. Made mistake of taking breakfast also - only to be disappointed, plenty of it but lacking quality. following a terrible arrival in Beverley at another hotel. I called The best western and Karen very kindly found me a room, a beautiful room. I was offered parking, a spacious room well equipped for my business stay and room service. Karen and the staff on duty were fantastic and made my evening a pleasant experience. I will book the hotel again. Well done Best Western on restoring my faith in human nature. Karen is a real Asset to your team and I want to thank her for her kindness toward me tonight. Although this is an old hotel we always enjoy a visit We had a lovely afternoon tea with a generous selection of sandwiches , cakes and delicious scone. It would have been even better with clotted rather than instant cream. Attentive staff especially Kevin. "Very tired Hotel, desperately needs updating! " Stayed at this hotel for one night, it is not very well maintained and desperately needs some investment. The only thing it has going for it is the location which is very good for restaurants and bars in Beverley. When we arrived at the hotel the person who booked us in moaned because he had just been up the stairs and now had to show us to our room up the stairs again! Not a good start to our stay. The hotel room was shabby and needed a face lift like much of the hotel, I would not recommend for someone who is looking for something special at all! It is such a shame, because this hotel could be a gem, if investment was made. "Excellent staff, sad old room"
Tired old 1970's décor let the room down. Taps had a mind of their own, toilet wouldn't flush (had to take the top off & do it manually! ), horrible old wardrobe. By contrast, the staff could not have been more helpful & the breakfasts were really good. Cheap enough, but the stench of urine in the Gents toilets downstairs was unbearable & unforgiveable. 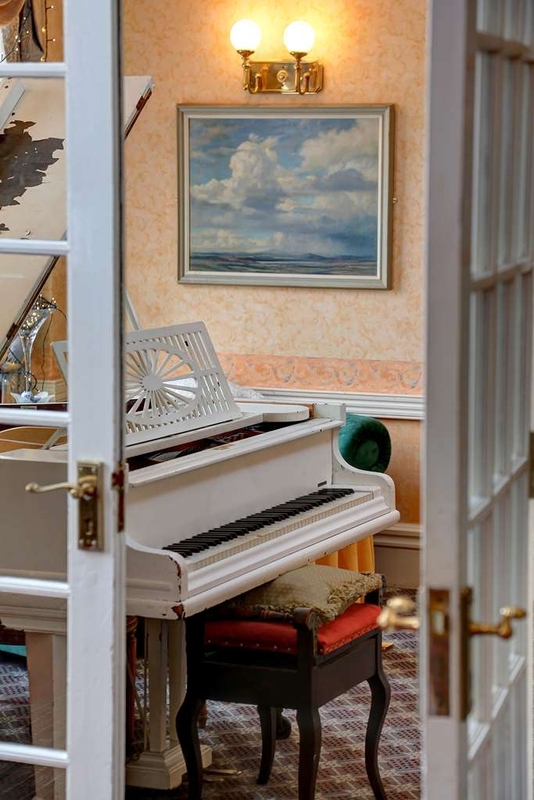 We stayed in the Lairgate for a couple of nights, for the Beverley Chamber Music Festival. The room was comfortable and quiet. Breakfasts were excellent. But what made our stay, were the excellent and friendly staff. Late one evening, after the concert, we struggled to find any restaurant open (including the hotel). We could find a Thai takeaway, and the Lairgate staff served us drinks, then got us plates, so that we could eat our takeaway. What a thoroughly decent experience - thank you so much, Lairgate. stayed here for the 2nd time, the staff are so polite and helpful, it's a quirky hotel, little rooms here and there, through doors up stairs, we love it, straight down a little gennel past the green dragon and you are in the main market square, no more than 10 minutes walk to the train station and Flemingate. The breakfast sets you up for the day, juices, cereals, fruit, yoghurts, traditional and veggie, or if you prefer something different, kippers eggs on toast, they do it all. We stayed in the honeymoon suite and it was very spacious, gorgeous 4 poster. will definitely be staying here again. My husband and I stayed at the Lairgate for a night away. We picked it because our experience of Best Western hotels has always been very good but we were so disappointed with this hotel. The car park was full due to a wedding but that wasn't too much of a problem as there was a large car park near by and it only cost £5 until the next morning. Our first impression of the hotel was poor. The reception is a tatty desk by the back door which looked shabby and grubby. We were checked in and showed to our room by a pleasant gentlemen which was lovely but I was surprised at how dated the room was. The furnishings are very 90s. Dark wood furniture, a cream unit over the bed which looked dated and shabby and an old fashioned carpet. The room was clean though and the bed comfortable. The bathroom was very basic with a nasty green vinyl floor and shabby towels. Our stay wasn't helped by guests who felt it was ok to come in at 4am and sing and shout until 5.30an although I completely understand this was not the hotel's fault. Breakfast was really good, plenty of choice and good coffee but again the dining room was tatty and needed a good redecorate. The staff throughout the hotel were friendly and with some investment this could be a lovely little hotel but definitely not up to Best Western's standards at the moment. A stone's throw from the historical town centre of Beverley. I arrived after 8pm and the car park to the rear of the hotel was full, but reception directed me to the council run car park which is only 20 yards up the road. My first floor room was spacious, clean and comfortable with everything you need. The decor may not be to everyone's taste but is very much in keeping with the age of the property. On the night I arrived there was live music playing in the restaurant, and a good atmosphere in the hotel bar. The historic town centre is accessed from any number of alley ways directly opposite the hotel. I had an early start on Saturday morning, and asked reception if there would be any chance of a breakfast before 8.00 when the normal weekend service starts. I was informed that the cold buffet would be set up and if the chef was in they would do what they could. I was in the restaurant at 7.20, and by 7.30 I had fresh coffee, toast and a full English breakfast, and what a breakfast. All the staff I met were friendly, courteous and extremely helpful. I wouldn't hesitate to stay again. Had booked 7 double rooms for our party, as it was my birthday celebration I was given a room with a four poster bed and the room was brilliant, it was spacious and extremely comfortable. We came back to the hotel at end of evening and we continued our celebrations in the bar, the staff were very accommodating and pleasant. Breakfast was as good as always. Our daughter Claire got married in France this summer but she (and new husband Martin) wanted an evening reception to celebrate with all family, work colleagues and friends who could or couldn't attend the 'French' event. After inquiring at quite a few local venues, we visited the Lairgate Hotel around April/May time to check the facility and its availability. We were all blown away by the friendly, accommodating and supportive approach by the staff. Karen asked what we wanted from the occasion and she did everything to make sure the evening went perfectly. In fact she was on holiday on the actual weekend of the reception but Tom had been fully briefed and ensured that the evening ran without any issues whatsoever! There were about 80 people present, an ideal number for the facility (although up to 100 would probably be OK). The 'bronze' buffet was perfect for the evening, Alan the DJ was brilliant, in fact we cannot find anything that fell short of perfection! Thank you everyone at the Lairgate and we'd recommend anyone looking for a party occasion for that sort of number of people to consider the Lairgate Hotel! Possibly a hidden gem right in the centre of our wonderful town! Stayed here recently for our first visit to Beverley, the staff were all very friendly. Our room was very clean, if a little out dated. Bed was comfy and room was pretty quiet, glad we got a fan though as not much air blowing through the window. We only had the one drink at the bar as on both night parties were happening there. Loved where the hotel is situated, and would be interested to find out the history of the building. When we go back will stay there again. Service overall was good.Breakfast meal appetising with reasonable range to choose from. Staff helpful and positive, especially when checking in. Location of room meant there was little disturbance from external sources.. Parking was somewhat challenging initially but managed to relocate car subsequently. 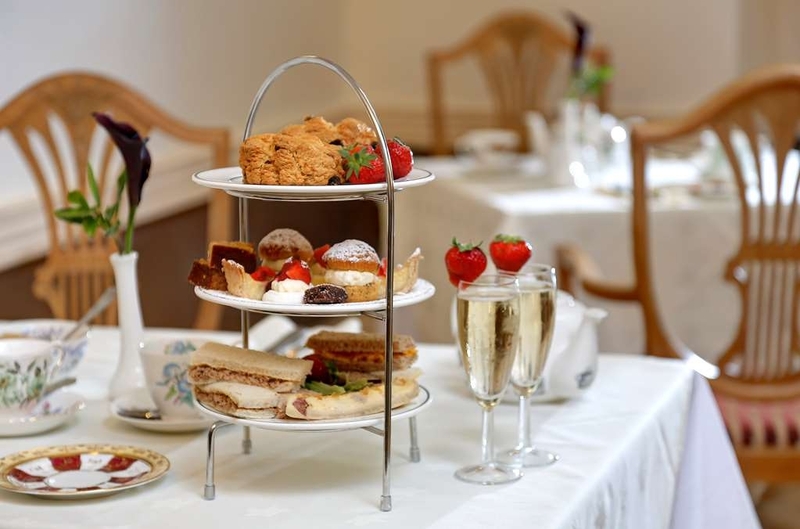 "Superb Afternoon Tea in a Lovely setting!" I recently visited the hotel after purchasing a TravelZoo voucher for Afternoon Tea and visited with my mother for a rather significant birthday. From beginning to end the experience was wonderful. We were asked if we would like to take out tea outside as it was a lovely day and we did so. Prosecco was brought out to us promptly followed by our pots of tea and the food which featured a huge selection of both sweet and savoury to choose from. By far the best afternoon tea I have experienced to date!! I would happily come again and be more than willing to pay her full price direct to the hotel as opposed to another voucher deal. Arranged for afternoon tea here whilst in Beverley and it was a real delight. 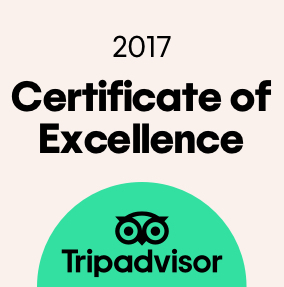 Service was excellent (the right balance of friendly and attentive without being over the top) and the food was wonderful. My daughter particularly enjoyed the warm scones with lashings of jam and cream. I really couldn't fault this place...what a gem. My first visit to this hotel this afternoon with friend who recommended it and another who hadn't been before either. Sat in lovely room on comfy settees. Ordered 2 coffees with toasted teacakes and 1 pot of tea. Barman soon brought these and moved the coffee table to make it easier for us. Coffee pot contained enough fresh coffee for 2+ cups each. Bill came to only £7.50 - a bargain. ?? "Racing at Beverley Tuesday 31/07/2018"
This is a very nice and well located hotel near town centre, its a good walk to the Races from here mind a steady 30mins, but must warn its a gentle hill for the last bit and not for anyone not great on there feet, reception will guide you too a taxi 2 mins away. Hotel room was functional and bed was ok, I slept well. Bathroom was ok just a little mould forming in way of shower (in the corner, bit of bleach would do the trick). Overall a nice place to stay but just to not Hotel car park small and a bit tricky to negotiate when busy. Lovely two night stay. 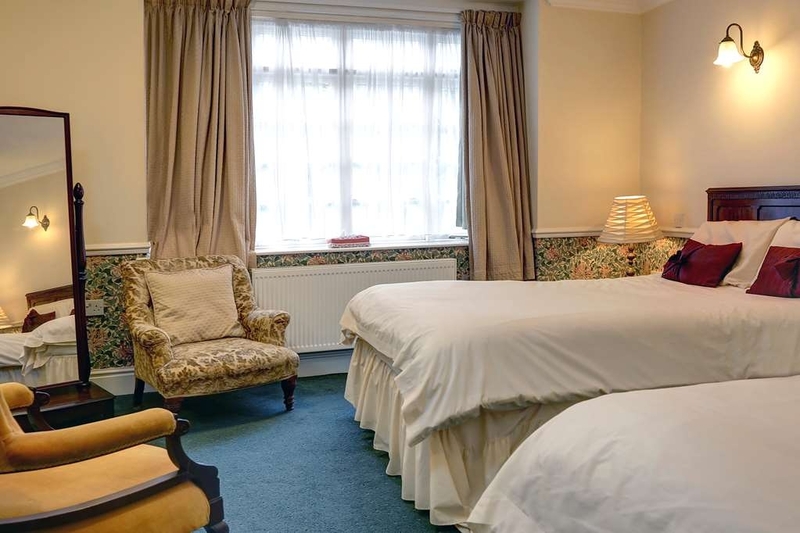 Very large room with extremely comfy beds and large well appointed bathroom. Very quiet at night. Food and service was excellent. Very friendly staff. Old Georgian building with lots of character, quite a change from the modern hotels of today. "Good value but a bit noisy"
This is a good hotel for a short stay. Rooms ok but a bit like going back in time - old fashioned dark wood furniture and a really uncomfortable bed but a very good shower. My room was right on to a very busy street on the ground floor and the recycling bins were emptied at 6am so it was not very peaceful. Breakfast and service good. "Very tied, would not recommend unless you wanted to be central to Beverly"
Hi just stayed for one night and that was more than enough. The place is so run down, could be used as a TV location for a 1980's TV show. On the plus side Breakfast was OK, but lacking on the continental side. Staff were polite. "Excellent Hotel, in good location"
The football was on and we wanted a meal in a quiet location called into the Hotel and staff were so welcoming. Served us at the table with drinks and food. We had Salmon salad and hot Salmon with a lovely sauce and vegetables. The chips were fantastic. Value for money will be calling back. Thanks for the great service Kevin. "Excellently Located Hotel with Character"
The Hotel is located off the beautiful Market Square, easily reached on foot yet on a Saturday night there was no sound intrusion from the busy town. Our room was extremely spacious as was the bathroom & nicely decorated. The staff both on reception & at Breakfast were very attentive & entirely English all of whom had excellent local knowledge & helped whenever they could. An excellent hotel in a beautiful town. "Friendly staff who cater for coeliacs, and in a great location"
A very clean hotel in a great location, with parking and lovely staff. Coeliacs are catered for. Our room was clean and large room with plenty of wardrobe space. It looked over the rear courtyard, so was fairly quiet. However, it had a strange mix of bed linen and new duvets are needed. Otherwise,was all good. "HOWEVER........... Somehow.. We loved it!" Please read down to the "However" ....... My husband and I stayed here , room only, booked last minute on the sunny Royal Wedding weekend. Very central. Car parking free but very tight. Spent a lot of time parking up - shunting in and out. Reception dated but male member of staff pleasant. Showed us to our room on the ground floor through lots of "Unswinging" doors and a few steps. Room 35 !! The one room we'd looked at online and not wanted!! First i'll give you the bad points but please hang on because there were good points... On first impression - oh my goodness - are we in an old people's home? Old decor and old peoples furniture. Hotel and room so dated and the double bed looked so old we could imagine Scrooge sleeping in it!! The room had old wooden furniture. Old pull out wooden table and old arm chair. Threadbare mat. Walk in wardrobe cupboard. Only one bedside table that was so crooked and crippled we were lucky to put one cup on it. The bed was wedged in an alcove so unless you're super slim ( and we aren't!!!) you would have to be a contortionist to get in and out of. ( considering most people here were probably in their 80's I think that's why this room was saved for "younger guests"). The view from the window (which we found impossible to open) was of a dirty unkept small courtyard with enormous scaffolding holding "something" up. The bathroom was quite nice - good in-bath shower with plenty of hot water. Steps up to the bath area. Green towels but very clean and quite big - we had to ask for another as only one bath towel provided. Unfortunately the toilet didn't flush properly, took some clearing , and the hot water tap needed a warning sign - scolding!! HOWEVER...... There was a lovely wide screen tv. Good tea and coffee making facilities. Iron and ironing board. Hair dryer. The place was clean and guess what??? We had the most amazing comfy nights sleep ever!!! The bed was So comfy!! Staff were helpful and pleasant, we had a "Do not disturb" sign on and they just gave us what we required. Very quiet hotel. Lovely little area outside at the back. Very central. .... In fact a pleasant change from the modern" no character," chain hotels . GO FOR IT !! Very friendly staff who couldn't have been more helpful. Check in and check out was easy. There's obviously been a lot of money spend on the communal areas which look clean and fresh. Unfortunately in my room The carpet was starting to get threadbare and the pillows were hard and lumpy. The room decor just looked tired which was a real shame. I hadn't expected light green towels either...! We booked a few weeks ago and arrived shortly before the check in time. This was no problem to the staff and we were given a room at the back of the hotel overlooking the car park. The room was clean and comfortable and quiet. The bed was comfortable and the bathroom small but well stocked with plenty of towels and shampoo. We were booked room only for one night but really enjoyed our brief visit and will have no hesitation staying here again. "The Jewel that is Beverley"
Beverley is a Fantastic Place to Visit, We All rated the Hotel as an excellent place to stay. So convenient as you can walk into the centre of Town in a minute. Quiet overnight too. Lovely breakfast. Bar drinks were not expensive. Free Parking too. I read all the good reviews for this hotel before booking so felt happy that we were going to stay in a great hotel. Sadly this was not the case our room was dirty and very run down none of the windows opened and it was very stuffy in the room as it had been a warm day (no air con) half the light bulbs in the room didn't work there was a small table with the tea and coffee making facilities on with turned legs that were thick with dust. We only had one side table so used a chair that had a pink velvet seat with a large brown stain on. The bedding was very old and mismatched and my pillow smelt awful. The bathroom was dirty the bottom of the panels on the door were filthy and the door itself had marks on where some one had splashed coffee or tea, the toilet would only flush intermittently and smelt awful every time you walked in. The supposed toiletries supplied was a pump hand wash and shower/ shampoo. Wherever you went in the Hotel it smelt and looked old dirty and run down. One of the staff that had worked the previous evening on the bar at the wedding that was taking place was serving breakfast they had on a black shirt that looked as if it had old food stains. We paid £99 for a night and would have still been disappointed if we had only paid £40. We were really looking forward to staying in a period hotel after looking at the pictures on the web site but won't bother again we will be staying in The Premier Inn next time. Stayed here for two nights with my husband as we were attending a wedding in Beverley. The hotel was great. Our room was huge with a really comfortable bed. Breakfast was really good. Great choice of cereals, fruit juice, fruit etc and then a very tasty and filling cooked breakfast. The staff were all very friendly and helpful. I'd stay again if we're ever back in Beverley. We booked via Expedia for one night £59 we didn't bother with breakfast at £10 as we decided to eat in a local pub the next morning for £3.49.... Can't fault the hotel, we were made very welcome and allowed to check in early, the room was comfortable and clean. The hotel is situated a few minutes walk from the market square and convenient for shops and cafes and pubs. Would definitely stay here again, but check different websites for varying prices. No faults at all. Ideal location, check in smooth, friendly staff, room clean and spacious, the bed was so comfortable I didn't want to leave it. I didn't have the breakfast so can't comment on that. Looking forward to my next stop over in Beverley. After a long Good Friday drive from the south, the warm welcome was great. All staff were friendly and happy to help. The bedding was clean but a little tired. A great venue for visiting family in the town. Had a great break at the Best Western in Beverley. The staff were amazing and nothing was too much trouble. Breakfast was prompt,presented beautifully and piping hot.Close to all amenities, couldnt fault. "Fantastic hotel with lovely staff." Stayed as a last minute stay for going out with friends. Didnt fancy fighting taxis in the snow. Booked as it was the cheapest and expected a bad and dirty hotel. Was very surprised... Was clean. Room had everything we needed. Was a good quality especially for the price. Room was bigger then a standard premier Inn room. Staff were the main feature. Was greeted by a man who checked us in and was very friendly and helpful. Offered to take our bags to our room and took us to our room. It's little bits of service like that that you don't see anymore!! We crawled back at 130 in the morning and was greeted by a man who seemed genuinely happy to be there and asked if we were stopping for breakfast in the morning. Would stay here again ahead of others in the area. Top notch hotel! Stayed at the Lairgate and attended my mates 60 Th (held at the hotel) realy good time had by all,l the staff were great and the room and breakfast were first class lovely venue big thanks to everyone at the hotel. If you are seeking a break in the really lovely Beverley area and looking for an immaculately clean and cozy hotel, then we recommend the Best Western Lairgate Hotel.The room was very large, antique in style, including a four poster bed, with the normal modern facilities. The breakfast was excellent and plentiful. If you are thinking of booking for a celebration the hotel remains homely, yet large enough for great functions. I held my 60th birthday party at the Lairgate hotel in Beverley and it was the best night ever. The hotel manager Tom and his staff couldn't do enough for me and my guests in the build up and preparation and throughout the evening. It was an excellent night, even better than I imagined it and I definitely chose the perfect venue, the right band and best people to look after us :-) Around 40 of my guests stayed over and everyone enjoyed their stay, loved the hotel and loved their room and commented on the excellent breakfast. In addition to Tom, Paul & Karen were extremely helpful and Richard was amazing on the night, we kept him very busy behind the bar and he never stopped ! I stayed here one night to visit relations in the area. I stupidly left my Kindle charger behind and the staff posted it on to me with no fuss. Friendly welcome and a good "Full English breakfast". Very quiet at night so I had a good sleep - not always my experience in hotels. I stayed here on a Thursday night as I was on business in the area. The hotel is in an excellent location for visiting Beverley. The room was extremely clean and the bed was very comfortable. I was a bit concerned that I might not get a good night's sleep because the room was situated at the front of the hotel close to the road. As it was this was not a problem and I did get a good night's sleep. If I get the opportunity to visit Beverley again I will certainly stop at this hotel. Rude staff, managers who don't care what is going in their hotel, out dated and shabby, well in need of a refurbishment, and change of staff. Far better and friendly places in Beverley to stay. Very poor standards for a Best Western, lets the brand down. We enjoyed our short stay here at the best western in Beverley. The staff at the hotel are Friendly. The hotel itself has good parking enough for approx 10 cars. The hotel is situated close to the town centre with a wetherspoons pub a few minutes walk up the road. Well I can honestly say this is Beverley's very precious gem of a Hotel. We had a family wedding here in December and it truly was a wonderful experience from start to finish. All of the staff were so attentive throughout the whole experience. We has use of all of the downstairs rooms which as is was the festive season were beautifully decorated adding to the theme of the Christmas wedding. Many family members stayed over the night and they were all very happy with the standard of accommodation and spoke very highly of the breakfast too! 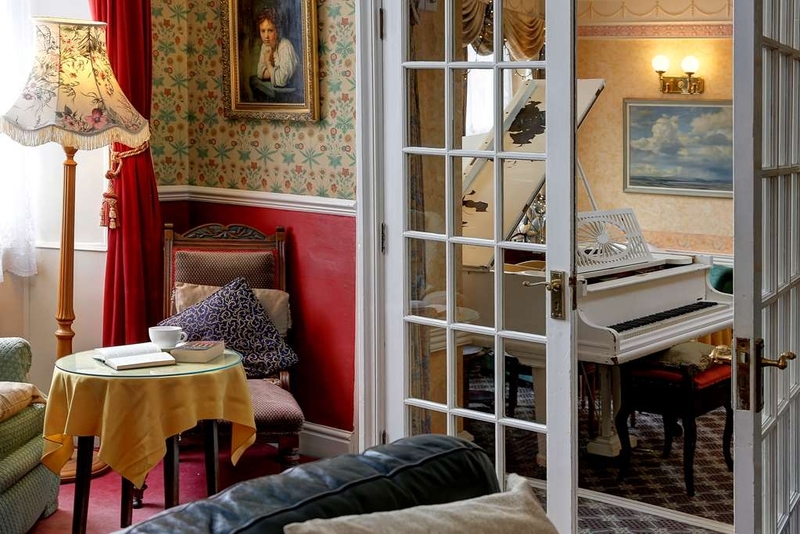 This wonderful hotel in the heart of Beverley has a traditional yet very elegant feel to it. All in all my son and his wife couldn't have wished for a more perfect day and it with great thanks to the lairgate hotel and it's fabulous staff. Would highly recommend this venue for celebrating all occasions. "Not the usual high standard of a Best Western"
Sadly this hotel is not the usual high standard of a Best Western hotel. We stayed overnight and unfortunately the room we stayed in was cold as two of the radiators didn't work, curtains wouldn't close and generally shabby. This was supposed to be a special stay in a four poster bed as we had never experienced this before. When I mentioned the issues of the room we were immediately relocated to another one, it was much better however still a bit tired and could do with some general maintenance. Both rooms were very big with furniture fitting the age of the building. The communal areas in the hotel were very pleasant and inviting with a lovely welcoming feel. We had thought about having a drink before going out but not sure if the bar was functioning or not. Although I had seen tea and coffee being drunk as we arrived. Breakfast was excellent with good choice and nice staff. There is a car park. Toiletries and tea making facilities, iron etc Ideally situated in the centre of Beverley and withing walking distance of markets, bars, shops and restaurants. Despite the hotel being a disappointment the staff must be highly commended. They were pleasant, polite, helpful and obliging. I cannot praise them too highly. Without this brilliant team I feel the hotel would fail. Stayed just one night but wished it could have been longer as we loved the little town of Beverley. My daughter and I enjoyed a lovely large room in an annexe at the back of the hotel which may have once been the coach house or stables area. 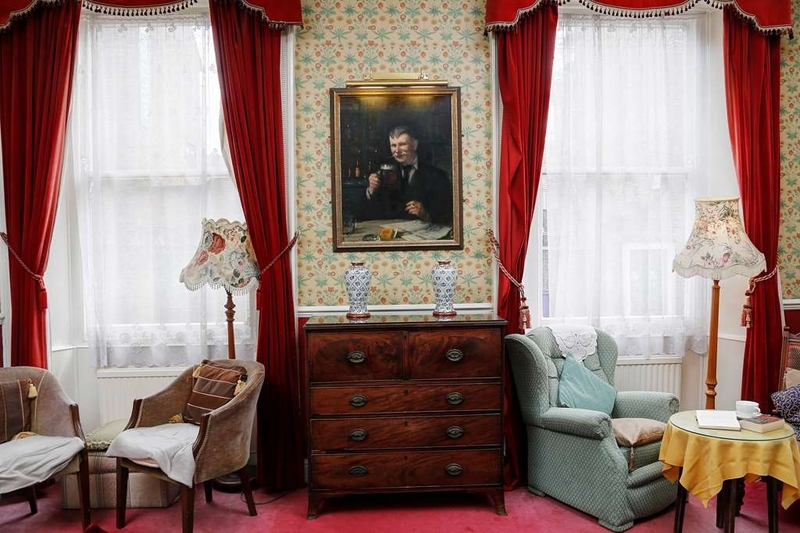 The reception rooms in the main building of the hotel had lovely olde worlde charm with comfy armchairs and plenty of antique furniture and decor. I felt that being located in the annexe our room lacked a little of this charm, it was slightly more modern and lacked the more lush period decor of the main building. 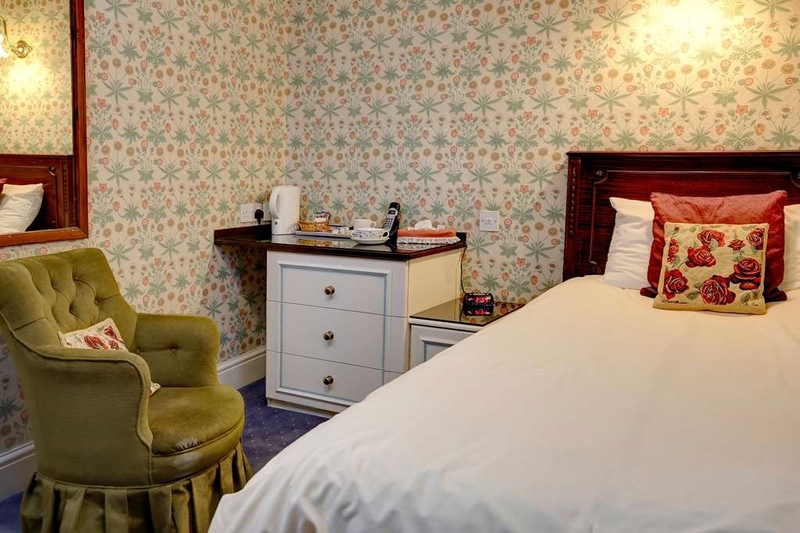 We did have lovely William Morris style wall paper below the dado and a couple of comfy wing back chairs and the beds were very comfortable so this is just a small personal nitpick with the ambience and nothing to with the quality of the decor which was excellent throughout. The bathroom was large, nicely decorated and spotlessly clean. There was a good size car park, which in these little towns is a big bonus as parking is usually quite difficult to find. Just wanted to flag one thing that I thought could be a problem in the warmer months. The annexe rooms look directly out onto an el fresco terrace area which I think might get a tad noisy into the evening on fine nights so bear that in mind when booking in Summer and perhaps request a room in the main building which may be quieter. For us travelling in Winter it was no problem and we had a very quiet and restful night. Breakfast was excellent in a charming dining area and all the staff we encountered were extremely friendly and helpful. All in all we enjoyed our stay here and I would definitely recommend this hotel. Stayed at this hotel for one night 15th December and will definitely return. The lady who booked us in (even though we were very early) was lovely and very helpful. Our room was warm and comfy and clean. Lashings of hot water and nice towels. Breakfast was delicious and nothing was too much ch trouble. Location is excellent and is near everything you could possibly want to see. We will return in the Spring when the weather is kinder. The Hotel did everything to make our twins christening the best ever. The whole Family and friends had a great time in the Hotel. From arriving in the Hotel, having drinks in the bar, breakfast the service and friendliness of all the staff was fantastic. They could not do enough to make our Trip unforgettable. Great Hotel in a Great Town. We were staying over for one night in Beverley. We were greeted by lovely friendly staff booked in then taken through the hotel to our room. It is a very made up of several very old buildings so as you walked through there was something different to take your eye, a cast iron fireplace in the hallway, an old thief proof strong room door and the most welcoming lounge all warm and cosy. Our room was filled with sunshine during the afternoon but a little chilly later but we had a convector heater which soon warmed up. The bathroom was huge, everything was clean and lovely. Breakfast was amazing and it lasted us all day before we ate again. We shall definitely be returning. This is not a corporate hotel but a quirky home from home. "Convenient and comfortable with parking "
It was such a relief to arrive here after a long journey and it is a real plus to find a hotel with parking in a smallish town like this. The room was just outside the hotel, the only problem being that people tend to stand beside it smoking. The room was large with two 'double' beds although you would have to be pretty friendly to fit two adults in the smaller of the two. There were most facilities available but no ironing board and no soap for washing hands, though there were bath gels. I'm sure I could have gone to reception to ask for these but once I was in the warm I didn't want to go out again. The towels are green and a bit shabby. Lovely to have a bath as well as a shower. Two radiators in the room that you can adjust so it was really snug. The biggest annoyance as a business traveller is that the wifi kept dropping out. There is a nice lounge here and a small tea room although they don't do sandwiches which I found surprising. The breakfast was quite full and varied and all cooked to order. I don't think they should leave the porridge out because it becomes dry, congealed and unappetising but staff were happy to cook me some fresh. Check in was quick and the staff friendly and helpful throughout. It was good value too. Beverley is an interesting town with quirky shops and a big modern shopping centre nearby. The Minster is also beautiful. The hotel was in walking distance of all these. last minute decision to try somewhere different, booked into the Lairgate, rooms yes needed updating but added to the victorian look, there was little rooms off all over, and looks very charming, the hotel and rooms were absolute spotless, the bedroom was spacious, big bathroom, shower was very good, we stopped 2 nights and the beds made up each day, the breakfast was gorgeous a good selection, the hotel itself is off the main square but down a little alley and your there , would definitely stay here again. This is a Great place. We booked the same day and they were very accommodating. Lots of character to the building its self . The breakfast was great with lots of choice and the staff very friendly. We would stay here again. The location is great for all amenities of Beverley town centre, set back from the market area on Lairgate but with a very small walk to everything. The car park was spacious for quite a few cars, a bonus when wanting to be near amenities, someone had queried why cars were parked at an angle but could see why as this made it easier to get out again. Breakfast was included and everything was available, had the Lairgate cooked breakfast which was very nice. 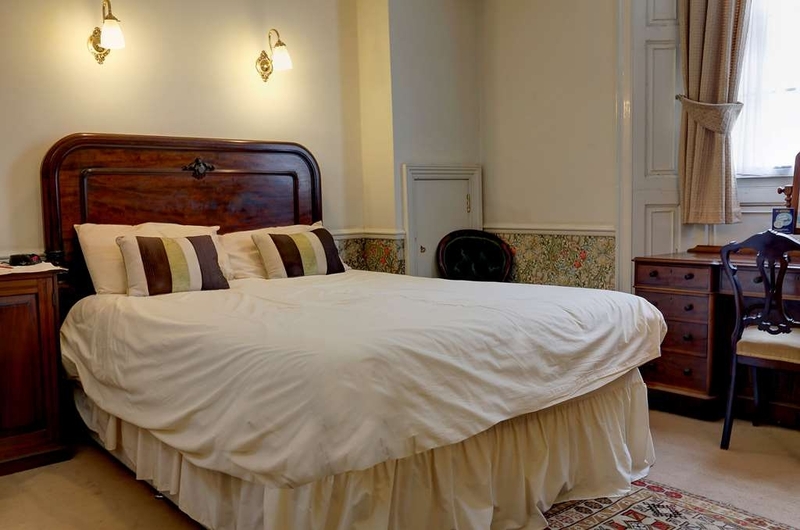 We had a room overlooking the courtyard and it was very spacious with a large bathroom, it had everything you would expect from a room, I agree with some reviews that rooms etc look dated but adds to its charm but was clean and tidy. When coming to stay in Beverley, of which we try to do when we can, as long as our accommodation is clean and tidy and in a great location that is more than we can ask as we spend time visiting the area. The staff were friendly and helpful and always pleasant and polite. Stopped here for one night. Very noisy room right next to the main road when requesting another room was told they were fully booked.....and suggested we use ear plugs or have plenty to drink in the bar before going to bed. Unbelievable response. Do not stop here. Small hotel right downtown. My room was charming and the hotel is very quaint. The en-suite was very nice and the breakfast even better! The staff is very nice and very helpful; would definitely stay here again. 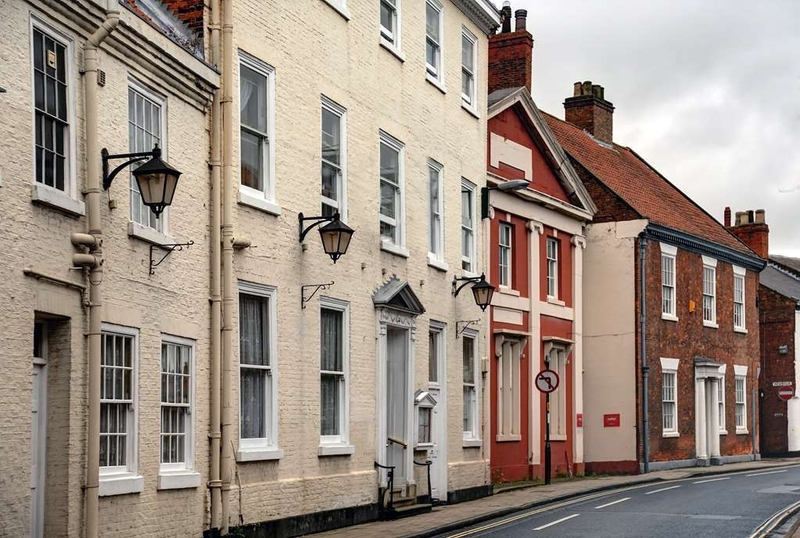 Comfortable, historic hotel in the heart of this delightful East Yorkshire town. Car park in an area where parking is challenging. Excellent breakfast but no evening meals. There are many nearby spots to eat. No lift. The location is superb if you want the town centre experience which we did so spot on, the hotel staff where very polite and helpful if needed but the whole place needs some money spending on it, fairly dirty and even bare plaster by the bedside cabinet, come on Best western spend some money on the place and we will come back! What an absolute hovel. This place smells like an old people's home throughout and is dirty, dated and not worth the £95 charge for one night. We booked three rooms and each one was worn out, threadbare carpets and stained bedding and towels. The beer was vile and tasted like it had been sat in the barrel longer than when the place was last decorated. Male bartender was rude and unfriendly. Would never stay here again, even if it were free. "a pleasure to return to this hotel"
We held our wedding reception in this lovely old building 30 years ago and decided to celebrate our latest anniversary at the same location by inviting family and friends for a re-union last weekend. We requested buffet food and were able to choose the menu, to include some vegetarian options. This was excellent and fully appreciated by our party of 35 guests, as was our breakfast the following morning. The hotel is tastefully decorated and our bedroom (the one with the four-poster bed) was large, clean and comfortable. While making the arrangements for this event with Karen and during our stay we found the staff to be friendly, polite and helpful and we are particularly grateful to Paul and the bar staff for making this re-union go so well. We would not hesitate to return to this hotel, which has the same charm now that it held for us 30 years ago. Absolutely great location near to the Saturday market & loads of shops & cafes. Beautiful William Morris wallpaper throughout. Our room was vast but had not a single picture on the wall. They knew there would be 2 of us but there was only one cup & one mini packet of biscuits provided & no tissues. Felt very scrimped. The shower was like something from the 70s with really weedy water pressure. Comfortable bed & helpful, friendly staff. Quite noisy as we were on the road side of the hotel. If it had been £50 I'd consider it reasonable but for £90 I expect a lot more. good clean hotel near centre of town but very tired. limited parking spaces we only just squeezed in. staff very friendly and welcoming.the room was ok but the shower was ineffective to say the least. would not like to stay for more than one or two nights.this hotel needs a lot of work doing to it. Very tired hotel, very 80's in feel, needs updating. We had room 26 which was outside, big room, big walk in closet, huge bathroom & bath, seemed great at first but it was in the courtyard where everyone smoked, so it could get noisy & smelly. The staff were really nice though & it was in a great location in the town with free parking. You cannot fault the hotel for cleanliness but everywhere just looks soooooo tired. Stayed in the four poster room £136 b&b. Really not worth it. There was no soap in the bathroom and only shower gel and shampoo for 1 person. The mattress was very hard (but I understand that is a personal matter). Breakfast..... the sausage tasted like old deep fat fried. My room was dirty and the staff were rude. Never again. It completely dominated my stay and put me off ever travelling to this area again. There is nothing more I can think of to say. Just not good at a all. 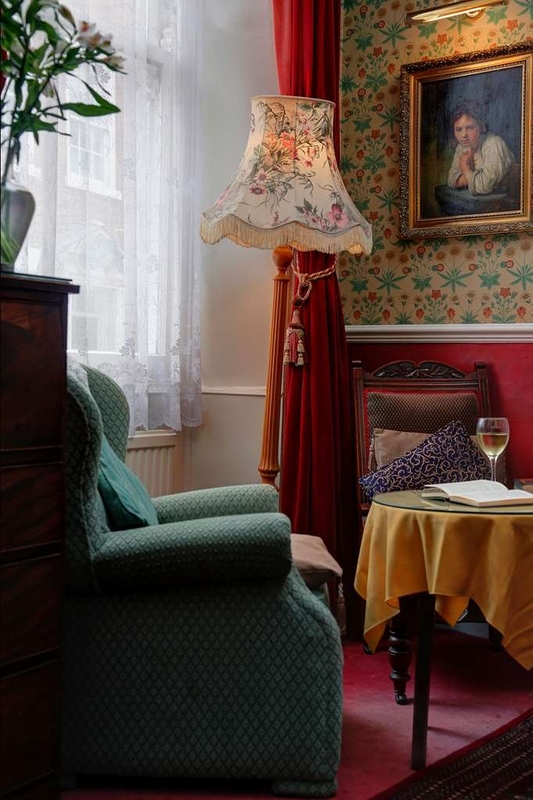 "A little gem with great staff"
We booked a two night break for my husbands birthday and we were not disappointed. Greeted by Paul on reception who throughout our stay was very friendly and helpful, by the time we had reached our room a "birthday" balloon and a bottle of cider had been left ..lovely touch. Throughout our stay all members of staff were very helpful and friendly nothing was too much trouble, Kevin the night staff gave great recommendations for places to eat. Our room was number 1, a large room overlooking the road, not disturbed by traffic etc. We had breakfast on both days the choice was very good, excellent quality and plentiful . The hotel is not new but its very comfortable and clean we would not hesitate to return and to recommend to family and friends. Very friendly and helpful staff. 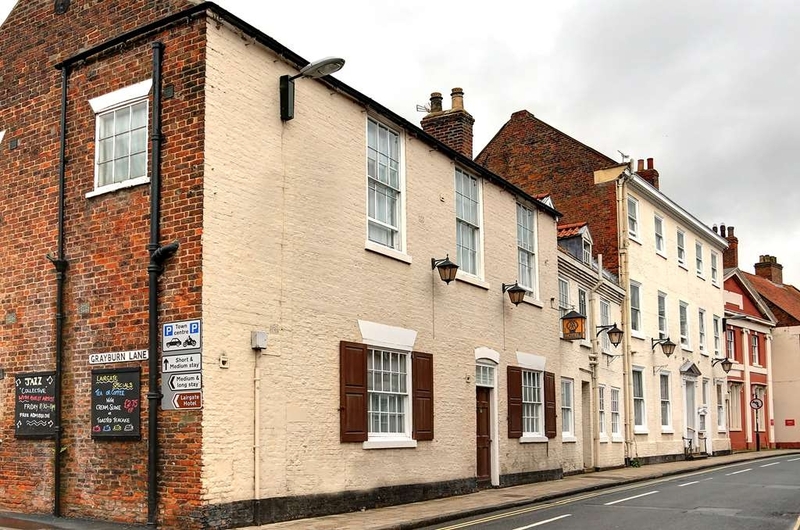 Situated right in the middle of Beverley making it easy access for restaurants and independent shops. Really nice choice for breakfast. Free parking and fast broadband. "Avoid until they sort out many problems"
Dated rooms & very noisy until about 1.30am. Lots of problems with the room like shower falling to bits, toilet paper stuck to furniture, TV continually pixelating. Staff were nice & very apologetic & said they were embarressed. We stayed as a couple for two nights in July 2017. The hotel is reminiscent of a traditional market town inn. It is central with easy free parking. We found the staff very friendly and efficient. Our room was clean and pleasant. Wifi worked well. Breakfasts were very good. All in all a good choice in a delightful small town. "Wedding reception and honeymoon suite"
We recently held our wedding reception at the Lairgate hotel, the staff are truly amazing, they are there to please and that's exactly what they did. We didn't have to worry about anything. Food was absolutely gorgeous. All our guest have commented on how wonderful everything was and how fantastic the staff the was. We stayed in the honeymoon suite, it was absolutely lovely, very spacious, clean, no faults at all. We stayed the night at a hotel near the heart of Beverley and this being our choice.On arrival we found that the parking facility was very small indeed and was lucky to park safely just to the side of the hotel.The accommodation was fairly priced with a room we thought was ok. When we came back for our evenings stay we realised that the noise from the road outside was very loud.With it being near the heart of Beverley we didn't realise that the surrounding buildings would magnify traffic noise so if your going to stay ask for a room near the back.Cleanliness wise our room was a seven out of 10. The breakfast was very nice for me but my wife's runny boiled egg was not attainable so a 6 for the breakfast from us.All in all not bad and I am sure they get plenty of trade with its position compared to people's desire to be near the town centre. Had a lovely weekend here has an old fashioned quaintness about it and we really enjoyed that, jazz band playing when we arrived, and staff helpful and smiling. Room was a bit dated, but clean and comfortable. I would recommend a stay here, right in centre of town too. I was staying for one night as needed to be in Beverley the next morning. Room was very comfortable and clean and nothing was too much trouble for the staff at all. Breakfast in the morning was also good if a little on the slow side. "A good base for Beverley"
The carpark is rather small and we took the last place, I'm not sure where the closest parking would have been. Our room was very comfortable and quiet even though it fronted onto the main road. 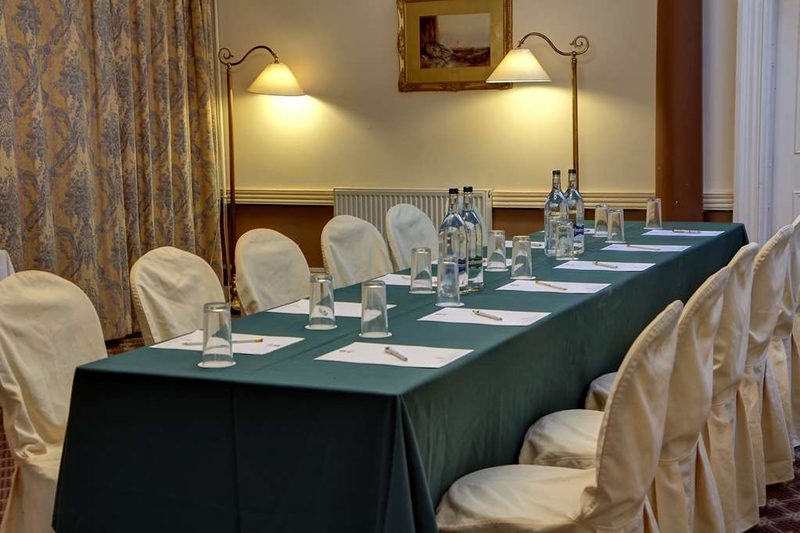 The hotel is very well positioned for the centre of Beverley which means that the lack of dining facilities is easily overcome by a 5 minute walk. Breakfast was served in the hotel and was very good. In Beverley for a wedding so Lairgate was ideal for our needs. Central and handy for shops, bars and restaurants with parking. It was the Races so the town was busy but we slept well in comfy beds. We would stay again. We stayed here for 3nights in June. The location is good, a couple of minutes walk from the town centre. Our room was spacious, clean and very comfortable. The bed was very comfortable too. There was a bath with a good shower over it and plenty of hot water. Yes, it's a bit dated in style but we didn't mind that at all as it's all been well maintained. The staff are all lovely, very helpful and welcoming. We had very good vegetarian breakfast every day, freshly cooked to order. We couldn't find anything to complain about at all. It was all excellent and we would definitely come back to the Lairgate if ever we return to Beverley. Having never been to this hotel ,I arrived to attend a meeting the member of staff I asked for directions was pleasant and helpful.The meeting room was large although a little hot ,but it was a very hot day outside.Lunch was a buffet and was excellent with a varied selection of savoury and sandwiches.Nothing was too much trouble,tea coffee and when asked for water the lady quickly fetched a jug and glasses.The toilets were spotless and I found it a charming and characterful hotel. "Simple hotel with good staff"
I just stayed here for two nights with work. On arrival I found I had made a mistake with my booking dates but they happily sorted this for me, without issue. There is free parking out the back but the space is limited so you have to get there early to have a chance. The hotel itself has a bit of a dated theme if I'm honest. It consists of floral wall paper, old wooden furniture, single pain windows, even faded green towels. That said the hotel was clean and tidy where ever I went. My room was located on the ground floor right next to the main road, which was a bit of an issue. The hotel has single pain windows with a gap in between that and another set of glass. This however did not block out any noise and it was a busy road with lots of cars and people walking up and down it. The room however was clean if a little tight for space on the far side where you accessed the closet. There was a small flat screen TV with tea and coffee making facilities and free wifi. The bathroom was neat and tidy with a lovely powerful shower. Though the attention to detail let's them down as the shower gel bottle was empty before I arrived, it was never filled during my stay nor was the bin emptied. I had breakfast both days I stayed at a cost of £10 which is average these days. There were your usual options of pastries, yoghurt, cereal, fruit juices and cooked breakfasts. I went for the traditional full English, it was well made and not to greasy. The staff at this hotel are friendly and will always great you with a smile and it's this that makes the place what it is. Overall this is a simple hotel with no frills and I do recommend it if you're staying in the area. "Just an average hotel really"
Beverley races were on when we stayed so our choice of hotels was somewhat limited. If every room was booked there would be a massive problem with the car park as it only holds about 12 cars at most. I'm not even sure, if there was more, where they would park as the on street parking is taken up with permit holders. The hotel is two knocked through together and the result is lots of corridors seemingly to lead nowhere but eventually your room is there before you. The rooms are very large and somewhat dated and I must admit for a Best Western i was somewhat disappointed. The room was clean but still left a little to be desired, but maybe I am being a little picky but for £99 without breakfast I don't think so. When we returned the bar was still open and I don't think it closes as long as someone is drinking. All in all it served a purpose and it helped to make the weekend what it was. Would I come back? as a last resort, there must be a lot nicer places for the price but if my back was against the wall yes I would, reluctantly. Lovely greeting when we arrived. Arrived early for the races and just wanted to leave our bags, however our room was already ready. Lovely spacious room. Decor was dated, however I liked it. Room was lovely and clean. When we checked out, again staff were very friendly and polite. Very close to Beverley center, you literally just step out of the hotel. Would recommend if staying in Beverley. Car park is tight for parking, however I do believe there is a car park nearby. A lovely hotel, welcoming staff, whilst the decor is not the most modern it is clean, charming and in keeping with the property. Would recommend this hotel. We did not take advantage of a breakfast so cannot comment on the meals. The one staff member is really helpful and very friendly but over worked. The car park is very tight but OK. Might be a bit interesting to get out in the morning. The hotel is very dated and in need of a bit of make over. They have stopped doing food but I am told there is a Thai restaurant nearby that is good. The room is comfortable enough and the shower was good although a bit crusted up on the shower head. The local area is nice for a run. The hotel could be really nice with a bit of TLC. I've stayed here a couple of times now and there is really nothing critically wrong with this hotel other than it needs a little updating and the parking is a problem on site but ample parking nearby. The staff are always friendly and diligent. The rooms are tired but clean and quite comfortable. But.. if you want to be in the center of Beverley with a view to being outside the hotel for the most part then this is an excellent option of good value. I'd recommend this hotel to anyone who doesn't need a 5 star hotel.. Very central hotel with a car park to the rear. Friendly service. Rooms are spacious but nothing like the pictures von the website . Quirky hotel. Decor and furniture quite dated. Not suitable for the infirm or disabled - lots of changes in level and no lift. Despite this, my first impression was of entering an old folks home. Older guests sitting around in the public areas and scrutinising new arrivals. Our room looked out on some loose roofing felt, a brick and a discarded plastic crate. It was however quiet and dark so conducive to a decent nights sleep. A tidy up job and some maintenance is needed throughout the hotel - tap tops damaged, etc. Not a bad hotel, but not one I'd rush to book again. Stayed at this lovely hotel in an executive room. We had come up for a wedding. The hotel staff were really friendly and helpful and were always polite. Beverley itself is a great place to visit. The town has a huge range of 'different ' types of shops. Loads of pubs and bars, restaurants and coffee shops. The Minster is well worth a visit. We spent a very happy few days here. We plan to visit again soon. Okay hotel. Okay staff. Okay room. Okay service. Nothing more nor less to add really. Stopped there on our wedding night and it was fine. There was nothing bad about it, just think we expected something a little bit more. "OK hotel with very friendly staff"
I have only given the Lairgate a 3 as it does not mater how friendly the staff are they can not make up for a tired and dowdy hotel. The best bit about my room was that it was quiet which is probably because the only window looked out onto a small internal courtyard/light well. The heating was hit and miss and the bathroom towel rail was never warm but it did appear to have underfloor heating in there (or was it just hot water pipes?) so not so bad. "Very friendly staff , enjoyable visit "
I stayed here whilst working for a weekend in Beverley, the booking having been made for me at the last minute. Although there is a small car park, it was already full when I arrived, hence I had to park elsewhere within the town. The location is excellent; on a main road in very easy walking distance of all of the town's main sights, shopping, eating, and drinking. Check in was efficient and friendly, with my room being just outside alongside the patio area. The room itself was large, if somewhat dated (not period charm, more care home chic) with a large if somewhat institutional bathroom. The room was very warm, in spite of the radiator being off. However, when opening the windows, particularly in the evening, the noise and smoke from the outdoor smoking area on the patio came into the room. This notwithstanding, I slept well. Breakfast was excellent, being freshly cooked to order, with staff who were attentive without being overly so. Check out, too, was efficient and friendly. "Where did all the staff go?" If you appreciate a bit of comfort while enjoying a good cup of tea and scone at reasonable cost - this is the place for you. Friendly staff and no noisy music. A good place to meet friends . Beverley is a lovely market town, plenty to see good shops. The city centre location make this a great spot for exploring Beverley,and surrounding area. The hotel was clean and the staff friendly and helpful. The breakfast had a great choice and was well cooked. Wanted to stay at the lairgate hotel for a weekend but only got the one night as they were full. Glad we got the one night it was a lovely hotel. We were looked after from the minute we walked through the door, the staff were very helpful and friendly. We went out in Beverley for something to eat then returned back and had a perfect nights sleep. The breakfast was first class, served hot from the kitchen and plentiful. We were recommended the sister hotel not far away in Driffield for our second nights stay, it was all organised for us. Thank you to all. "Awful room saved by friendly staff"
I stayed here for one night on a business trip and couldn't believe the room I was given. Room 4 was one of the most depressing rooms I've ever stayed in. It was dark and drab with outdated furniture and had an awful view, which can't be helped, through a filthy window, which can. My review would have been 1 star 'terrible' except for the friendly staff. Particularly the helpful lady who served breakfast and the fact that vegetarians were catered for. The room that is shown on the website for this hotel is a far cry from the one I stayed in. sub standard drainage so was woken early breakfast not good the room has a drainage problem,evertime someone above uses the toilet or bath the traps are pulled in the bath causing a loud noise that wakes you the breakfast was not good,and as we wewre the only ones in the dining room it was apparent the food wasntr cooked to order and was heated up,and please,yur in yorkshire,we have the best farms around for meats,why serve sausages that taste of cardboard,use your local butcher it may cost a few pence more but it will certainly improove the reviews. Stayed for a family party/reunion and yes the hotel is a bit dated, but the service more than compensated. Have stayed in 5* hotels and not received service anywhere near as good. From the moment we arrived until we left the staff were excellent and added the personal touch by making sure my Dad who suffers with Alzheimer's felt relaxed. We stayed in room 26 which was spacious and although the big metal bed is old the mattress was comfy. Great breakfast freshly made to order. If you like a plush modern hotel this isn't the place for you, but if you like friendly service and nice food then can recommend. "Stayed for one night and we were very happy"
Having read some of the reviews we paid a little extra and booked an executive double. We found a beautiful clean and spacious room and had a very comfortable night. The room temperature was just right and breakfast, which was cooked to order, was absolutely fine. There is some major work being undertaken in the lobby, but that did not affect us at all. The staff were all very friendly and helpful. "Could not stay even though I had paid !" I booked this hotel over the internet and pid up front. 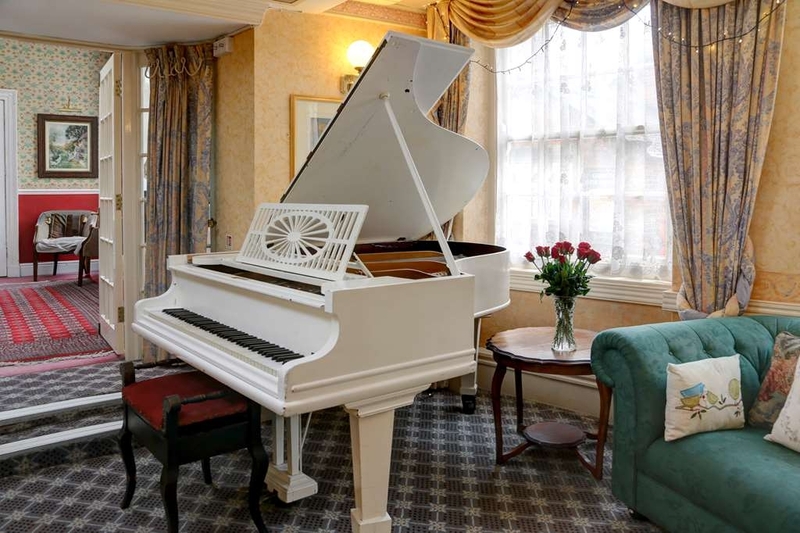 I was working in Hull and needed to stay over, I had always wanted to visit Beverley and I chose this hotel because of the good reviews on TripAdvisor and other sites. Either all the reviews I read are scams or I miss be living in an alternative universe. I cannot believe this hotel is part of the Best Western Group ; from the layers of dust on all flat surfaces, bro the scaffolding holding up the entrance hall, to the flickering light in my tiny, sad, dingy, grimy single bedroom - I just could not bear to stay. Just so you appreciate how bad it was - I left the hotel at about 7.30PM on a wet cold miserable November night with no idea where I was going to stay. It had been impossible to check out other places before living as there was no wi fi and no mobile phone coverage for voda at the hotel - I had actually waited for 20 minutes at reception before being served on arrival whilst the customer before me tried to pay over a wireless card reader which could get no signal. The receptionist gave up in the end ! Thank goodness there was just half a mile away a brand new, spotlessly clean Premier Inn with a massive comfortable king size bed and top quality sheets. I cannot imagine anyone wanting to stay at the Lairgate Hotel much less writing a decent review about it. You have been warned !!! Modern it isn't but this hotel was lovely. The staff were all excellent, I could not fault the room, I was upgraded and it was really a really nice room, or breakfast. The internet worked and the wine I had was really nice. The location is excellent. Great stay at the hotel but the bed in room 26 could do with a new one. Thought whoever was upstairs sounded like they were in our room, suppose it's character of the place as it is old. The breakfast was outstanding so u won't be disappointed. Ideally situated to get to sat/wed market. "Very nice hotel with great service"
"* Another Lovely Stay at The Lairgate! 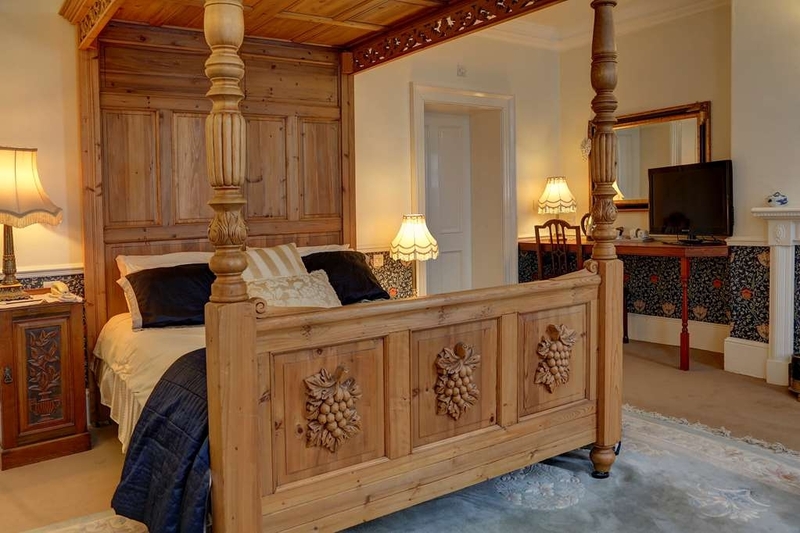 *"
This was our second time stay at The Lairgate Hotel, and once again was not disappointed. Hubby, myself and our friends attended the Murder Mystery evening and it was excellent ! The Hotel has a small free car park but we have never found it difficult to get a space . We were welcomed by very friendly staff who throughout our stay couldn't do enough for us and made our weekend away memorable. I had requested the same large room we had last time( 32 ) and was pleased to have been allocated it ( now has a wonderful four poster bed!) It was spacious , very clean and extremely comfortable.Our friends had a similar large room two doors away The evening entertainment by Murder by Invitation was brilliant. The 3 course meal we had there was lovely , clean plates all round ! We had a very comfortable good nights sleep and rose early to take a walk round the lovely little market town that is Beverly. The Hotel is very central and convenient for sightseeing . Back to the Hotel for Breakfast which couldn't be faulted . An excellent array of continental pastries, fruits , cereals , jams , fruit juices etc was followed by a most superb full English breakfast , cooked to perfection. Plenty of hot tea and coffee accompanied and refills were offered if needed. Our waitress was lovely and friendly . Check out was easy and handled well by the same very friendly lady . Well done and a big Thankyou to everybody at The Lairgate who ( once again) made our stay very enjoyable. I would have no hesitation in recommending this lovely Hotel and definitely look forward to our next stay there . Visited the other day for an evening meal with my family and I hate to say but is absolutely awful. The food was old fashioned and looked awful when came out to table. In most restaurants would have sent it back but did not see the point as our waiter a tall skinny young lad had such an attitude and apparantly was an assistant manager he needs to learn that his job is customer service and the manager should be training people to make you feel welcome not that I am causing a problem asking for food. The food as I said was awful which was surprising as heard a chef I knew from the game bird had started and loved the sort of food served there. I must say food was out dated and tasted awful. With the amount of competition this premises needs to improve and modernise. The hotel is tucked away on Lairgate and the original house dates from I believe the 1700's. The hotel is well appointed and as a lovely warm comfortable feeling about it. The room was to say the least was large with a huge bathroom which my wife loved. You could not have asked for anything more from the staff they were welcoming and friendly nothing was too much trouble for them.. If I had one minor criticism the bar prices were a tad high but I 'm a Scotsman living in the Midlands. We stayed for a couple of nights and I must mention the full English breakfast, it was absolutely fabulous a real plateful. On our final evening for ease we chose to eat in the restaurant the food was reasonably priced and excellent. There was even the bonus of live entertainment after. An excellent hotel for anyone wanting to see the Minster and be in easy travelling distance for the coast and York. Would I stay there again yes most definitely. The hotel is a good quality typical market town hotel. It is centrally located,spotlessly clean, has good bar and the staff are exceptionally pleasant and helpful. One reviewer complained about the furniture being old and not matching - they are called antiques! "Full of charm and character." I stayed here whilst on a course at the Defence school of Driving at Leconfield. I stayed in room 15 which is on the top floor (third story).The room was quite large with two beds and pleasantly appointed with a 1930's feel to the room with the decor, curtains etc of that period although the facilities were modern. The Breakfasts there were spot-on with whatever you wanted to eat seeming to be no trouble at all for the chef. The waiting staff, the porter and receptionists were all very courteous and genuinely polite. The actual hotel itself is charming, looking to be several hundred years old in places meaning some of the stairs are a little creaky and narrow with a few creaky floorboards in the corridors but this sort of adds to the atmosphere of the place. If I'm honest, the only really negative points to this establishment is that the car park isn't really adequate, I struggled to park my car and that was a tiny Ford Fiesta, and people who are elderly, infirm or disabled might struggle with the stairs (it was forty steps to my room on the top floor). Otherwise I really liked the place. "Wedding reception and evening venue"
"Lovely stay with lovely staff"
I Stayed here on a short trip to Beverley earlier this month. The staff were great and accommodating, nothing was too much trouble. Food was lovely and the room had every thing I needed. Parking was free and convenient. 10/10. Will definitely be returning. Stayed here for a wedding, the room was really hot and noisy. The bathroom facilities were broken, not enough towels and not clean. Complained to the, hotel and basically was told that the couple who got married enjoyed it so what was our problem ? There was also scaffolding in the hallway !! Not impressed and feel they have let the name of best western down . "The most perfect wedding day"
"Musty rooms but good breakfast and staff "
We went up to Beverley over the August Bank Holiday weekend to visit my aunt. The Premier Inn was full when we booked 3 months prior to our visit so we booked the Lairgate. The rooms were ok but the problem was the musty damp smell on the rooms on the top floor where we stayed - not healthy at all - my brother who stayed in the room down the corridor got a chest infection. The breakfast was good and staff very helpful. The rooms/bathrooms just need some urgent work doing. "Old Fashioned, But Very Pleasent"
The room we were given was up several narrow flights of stairs, with very sticky handrails. There was no shower, just an old bath. The bed wasn't particularly comfortable and the little sofa in the room had broken springs. The skylight was dirty inside and outside. We complained to the booking company, Hotels.com, but are still waiting for a response 2 months later. old-fashioned comfort, attractive, clean décor. a short walk to the centre of the town. The mattress could have been a bit more comfortable but at least it wasn't that horrid foam material so many seem to be made from now. There were building works going on while I was there but clearly that's temporary. I would certainly come again. "Wedding reception & evening celebration!" From the first contact, right through to our wedding and departure.....everything and all the staff were brilliant! Special thanks to Rita and Tom, who we really enjoyed meeting and made our day a truly magnificent occasion! Their professional, yet friendly approach was just what we needed and they never failed to deliver. The food and service was excellent throughout, be it management, catering, bar staff....everyone! Brilliant! All were helpful, perceptive, adaptable...just everything we could have wished for on our special day. Nothing was too much trouble! Our room was divine (the honeymoon suite), tasteful, classy, traditional and a fantastic antique pine four poster. All the guests stated their enjoyment of the meal and later the buffet, with the service second to none. We are extremely appreciative and grateful that we made this choice! "Amazing from check in to check out"
Nice hotel, older style rooms stairs and hallways yet comfortable, clean and relaxed. Very friendly and helpful staff. Good breakfast. secure and secluded parking which is a great relief in a strange town. Very nice outdoor patio. Would gladly visit again. I stayed at the Lairgate with my husband after our wedding and we returned again a year later for our 1st anniversary. We loved it both times. 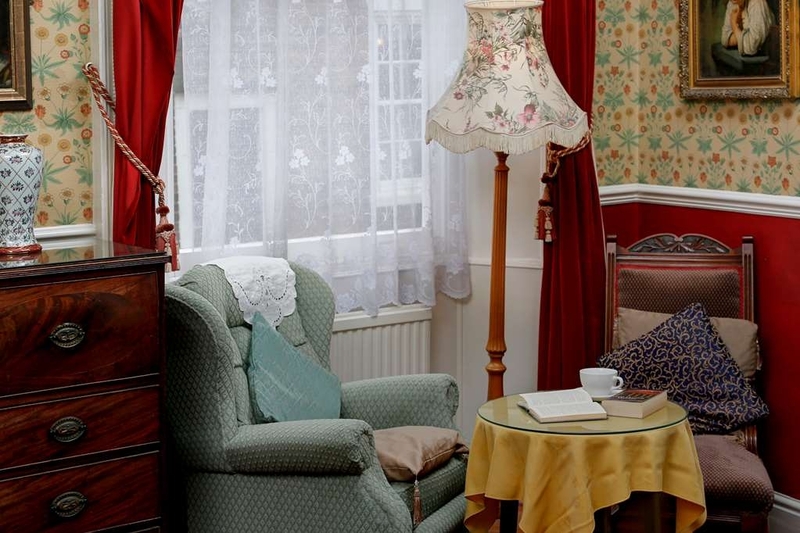 The hotel is beautiful and the rooms are decorated and furnished in a lovely vintage style. The staff are really helpful and friendly and the facilities are of a high standard. Breakfast at the Lairgate is worth paying the extra for and if you plan on having an evening meal the restaurant is very good. "Expected better for a Best Western"
Hotel is very central but as soon as you arrive, there are signs everywhere stating no smoking. All well and good except the first thing we saw was a member of staff hanging out of the door smoking. Not a good start. The car park was full. When we asked at reception whether the car park would empty later allowing us to park, we were told no, we would have to park elsewhere. When we explained that we chose that particular hotel because it had a car park, the guy just repeated that there was a car park nearby we could pay to park in. Again, when we explained that a weekend away is hardly relaxing if you have to look at watches and continually go and change car parking tickets, the guy did not seem to get it at all! The actual hotel is in an old building with lots of twists, turns and stairs to get to the rooms. There is no lift which was a little surprising as many of the guests looked older. The main staircase at the front of the house was cordoned off and had scaffolding all around it with bright warning tapes strewn all over but have no idea what was being mended / built / renovated. The overall feel of the hotel was a bit sad and maybe needed a bit of TLC. The room was large but had no real view to speak of - just some rooftops. There was nowhere to sit and write with a decent light source which can appreciate is not top of everyone list but the room did not seem to be well thought out. There was an eclectic mix of old furniture but none of the chairs were that comfortable meaning to sit and relax, you had to recline on the bed. There were little bottles of toiletries in the bathroom tho no shower gel. These were not replenished, nor was the beverage tray even for a two night stay which was a bit cheap. The beverage tray had only whole milk which is very curious in this day and age - who has whole milk nowadays? The chap looking after us at breakfast was lovely, He was friendly and efficient but the food, oh my, it was not good. Very cheap ingredients and swimming in grease. Usually look forward to a nice 'Full English Breakfast' whilst away but only had one on the first day and declined the second. The sausages were particularly fatty and tasteless. The towels in the room did not match and there were no finer points like a box of tissues in the room - not what I would have expected from a three star hotel. Will never return here. We were given two separate rooms as a twin was not available. The rooms were well appointed but very noisy as a result of people walking past. Breakfast was not very good, as the chef did not seem to know how to poach an egg properly There was decent parking but there was not enough staff to provide a prompt service. We had an overnight stay here and found the hotel to be quite quirky with little sitting rooms and stairs which went up and down. Our rooms were decorated and furnished in keeping with the age and style of the property. Beds were comfy, rooms spacious enough and clean. Nice to have a bath as well as a shower although they were a little on the small size and plenty of towels. Well stocked hospitality tray and a walk-in wardrobe which was nice. Flat screen TV with plenty of channels. Our only complaints were that the rooms were overlooking the road and were very noisy. Where was everyone going to in the middle of the night? Breakfast next morning offered plenty of cereals, and yoghurts and juice. The cooked option was to order and nicely presented but the sausage were grey in colour and not very nice. We left ours and noticed that the people on the next table also left theirs. My daughter and I both ordered poached eggs but my daughter took the first taste and said it tasted strongly of vinegar. I hate vinegar so had to just eat the yolk and none of the white.The menu said there were pastries but there were none on the table so we just had toast. Well situated for visiting Beverley- just a very short stroll to the centre. We had our wedding reception at the Lairgate in July and it was a great day. The room looked lovely and the food was great, especially the cheesecake . Tom and the staff were very helpful and made our day really special. Thanks very much. We chose to have our wedding reception here at the Lairgate hotel back at the end of July and we couldn't have picked a better place. From start to finish everything was perfect and the staff couldn't have done anymore to make it special for us. They made sure the running of the day went so smoothly for me and my husband and also our guests commented on how much they felt looked after and made to feel welcome to the hotel. The food was so delicious and so very well presented, the chef even made the food fun for the kids by turning the melon dish in to a smiley face ??. That extra touch! Most of our guests were staying overnight and next day at breakfast all they could talk about was how lovely the room was. We were in the honeymoon suite with a gorgeous four poster bed and the room was so spacious! I honestly could not fault anything about our day, the hotel or the staff. Definitely 5 star service, thank you to everyone involved. Hotel room was wonderful, four poster bed and lots of space. Hotel location is right in the heart of Beverley, couldn't be better. Car park is small but there is a pay and display very close by. All the staff we encountered were friendly and helpful, would stay here again if in Beverley and the price was right. The internal layout is "interesting", the rooms are well sized, clean and comfortable with en-suite, tea/coffee facilities and Wi-Fi. 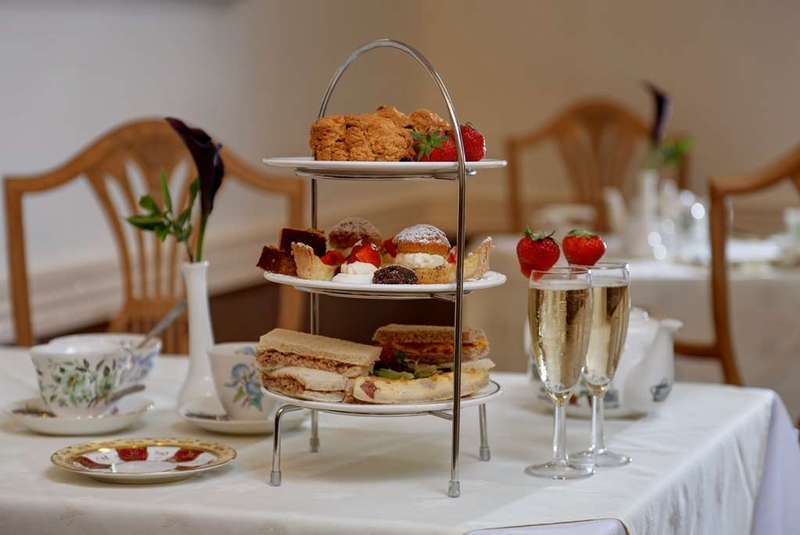 The Staff are friendly and helpful, the food is good especially the afternoon cream teas (highly recommended and calorific). The hotel carpark is limited but within 50 metres is a reasonably priced alternative. My wife and I stayed for couple of nights as we were at Beverly races. The hotel is comfortable and welcoming. It is more old style traditional and lounge areas that are ideal to sit and chat and relax. The bar area is good and the staff were efficient and chatty. The standard room was adequate for our needs and the bed was comfortable. Unfortunately there is no lift so stairs to rooms may be difficult for some.We would definitely return. Nice little, but bigger on the inside hotel. The room I stayed in was a little shabby, but not too bad, and it is worth pointing out they were having some redecoration work ongoing at the time. From the outside you would be fooled into thinking this is a small hotel, and I suppose it is really, but once inside it does open up somewhat. The staff were great, the bar is 24 hours, the location is ideal. Would certainly stay again. "do not stay in room 34!" £72 for a double room. Small car park which was full but there is a nearby car park for £5.50 all day parking. Hotel was larger inside than it looked from outside with a little courtyard which was nice. We originally had room 34, however, did ask to be moved which wasn't a problem-thankfully. We couldn't have slept in this room. Characteristic and vintage is one thing but this must have been an original when the place was built. It smelled and was extremely dark and eerie. The breakfast looked nice but obviously cheap quality ingredients as the taste reflected. A couple of the staff let the place down which was a shame but the rest were lovely. Wouldn't stay here again. Great location though. We arrived very late looking for suitable accommodation in Beverley during the weekend. The night staff were very helpful and found us a room. We were provided with an old- fashioned, basic but perfectly adequate, quiet double room for our over night stay. Centrally placed in Beverely. Reasonably priced for a BW hotel in a beautiful East Ridings town. "Thumbs up from a global traveler"
This is a charming and quirky hotel, with excellent staff, centrally located in Beverley. If you want the modern place that is polished, this is not for you. If you want English charm with a comfortable feeling like you are at home, check in here. It is not good for anyone with mobility disabilities however. Short notice online booking via their website. Far cheaper than on Booking.com and Laterooms. Took a single ensuite plus breakfast, worth every penny. Lovely room, shower and big bath which I really enjoyed. Really comfy bed and super quick Wifi. Good telly and tea making. Breakfast was terrific. Spacious dining room, loads of fresh juice, fruit, yoghurt, cereal etc. Good menu, full english was freshly cooked and deliciously substantial. All the staff were great. "Wonderful place for afternoon tea"
My partner and I have only been for afternoon tea which was excellent. Lovely food and excellent friendly service. The various reception rooms looked very clean and had a wonderful homely look and feel to them. As a Hotel to stay I would suggest you look at other reviews. Stayed here for one night. Hotel is rather old fashioned in decor but rooms are big and comfortable with lots of storage space. Bed excellent so had a good night's sleep and the hotel is set in a quiet location. The staff are very helpful and breakfast was excellent. Stayed in Beverley for two nights at the Lairgate. Our original hotel the Beverley Arms had closed down and no one had informed us. The Lairgate accommodated us at the last minute. Lovely comfy hotel, clean and lovely breakfast. Great location right near town . Beverley lovely. Peaceful ,good shops, clean and friendly. Only downside of hotel was the noisy air con unit outside the kitchen which woke us very early every day. "Decor a bit tired but staff excellent"
"couldnt do enough for us"
from the moment we arrived the hotel staff couldn't do enough for us. You go to a lot of hotels and the staff are like robots "not at the lairgate hotel" They made us feel at home we felt we could chat to them like they where friends of ours. The room we had was so clean the facilities where great and the breakfast we had was 110%. We also decided to eat there on the evening could not fault the food one bit. We met Tom the manager who introduced us to front of house staff "Kev, karren, and steve who all really look like that they are happy to work there. If you are visiting Beverley or hull I highly recommend you stay at the lairgate hotel. "Nice comfortable if a little dated"
Spend a couple of nights here on business. Pros Friendly staff, nice breakfast, good sized room and TV. Bed comfortable. Central but quiet location Cons Bit dated decor, room was warm (although a fan was provided) and a lack of cold water, rather than luke warm. My husband and I had booked into The Kings Head Inn across the way, but they had lost our booking (despite sending a confirmation in September 2015). So this hotel, were able to book us in at the last minute. Unfortunately, it is a little tired and dated for our taste and felt more like an older person's resident, but clean. The staff were very lovely too. We didn't eat here, even though breakfast was included as we had to leave early. Visited for afternoon tea with my son, The staff very friendly, made you feel welcome, brought my son two glasses of fizzy Apple juice, with strawberries in, to go with the prosecco the adults had. Plentiful , would easily have fed three people, what we had was very nice.Good value for money. Centrally located. All staff very friendly, helpful and cheerful. Speedy check in and check out. Hotel clean. Spacious room was very comfortable situated just outside of main hotel with own porched separate entrance. Good breakfast - nothing too much trouble. Have stayed here before and will again. Booked very last minute after being let down by the closure of the Beverley Arms Hotel. Very friendly staff, old but well kept building. Our room was very spacious and comfortable, if a little on the warm side. Best full English breakfast we have had in a very long time. Would definitely go back. just off the main street in Beverley, this has been a prestigious hotel in its time, but now a little frayed about the edges. The staff were realy very friendly and helpful. The little desk clerk help`d carry our case up the stairs for us. As the stairs were rather steep, and there was no lift. The room was quite pleasant, overlooking the patio. And tended to be rather noisy until the bar ajoining the patio closed. it was a quite warm, and we had to have the windows open to let some air into the room.so this also made it rather noisy. Surprisingly this hotel is only a 3-star. It easily outperforms many four-star hotels. There is a very homely feel about this hotel, and a welcome change from the modern grey rooms found in most chains. Staff are especially friendly and welcoming. I was here on business, and my wife accompanied me. She had plenty to see and do within walking distance of this town center hotel. "Lovely Hotel ....great central place to stay..."
We called in on the off chance for an afternoon. We hadn't booked but they managed to accommodate us. What a spectacular spread. We all enjoyed three different sandwiches, quiche, cheesecake,chocolate brownie, cream cake, scone with jam and cream plus pot of tea and procecco. Very well presented with friendly and helpful staff at £25 for two people. Very tasty and well worth it. We ll defiantly come back again. we had one nights stay before returning home. the weather was realy hot, and thank goodness there was a fan in the room. the hotel staff were realy warm and friendly...located in centre of town was quite quickly handy for all shops ets. Having stay here many time the hotel is well known. The check in was completed by someone |i had never met before he give me a single room but would not upgrade being a Platinum card holder and a regular I would have expected this. "Stunnning Room and then Disappointment"
The downside first: the hotel has a very small car park. There is a pay & display car park in the same street, but (& maybe it's just me) I never like leaving the car overnight in these (it was, naturally, fine). 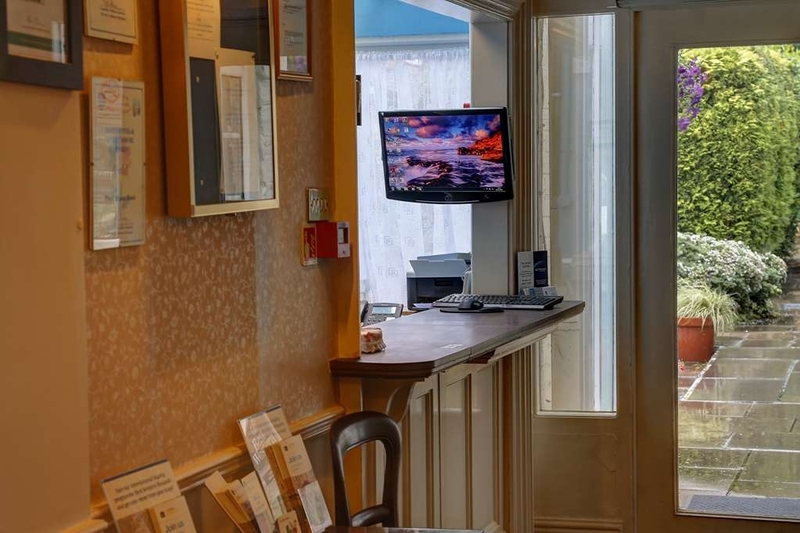 The hotel itself is excellently located, a few minutes walk from the main street, in a very quiet spot, so it's handy for pubs, restaurants and attractions. The room was large, with a very comfortable 4-poster bed. The TV was probably a bit small, but we didn't watch it anyway. Staff were friendly, breakfast was good and substantial. Close to town centre with character and charm. The Awards dinner we attended was excellent in a wonderful atmosphere. Everything went well with hot food and good service. The staff made our evening one of the best. Thank you. Just spent the weekend as a party of 18 for a family wedding. If you like character and just a hint of fawlty towers then this is the place for you. Absolutely wonderful. Would definitely return. Beverley is a lovely town and the hotel is in a fantastic location. "Nice old hotel near to town centre"
It's a nice old fashioned hotel close to the town centre. The hotel is clean with friendly staff. Our room was a bit wonky due to the age old the building. It was nicely furnished and had freeview tv. They gave us a heater as the radiators weren't working. We didn't have hot water one day but they fixed that. The afternoon tea was perfect. Loads of choice and nicely presented. The breakfast was served to order and very nice. They could do with a lift as we found the stairs difficult with a suitcase. You go out of the front door, across the road and down a short alley and are in the town centre. The car park is tight to say the least. When we arrived someone was coming out and we took their space, the same happened when we came out, someone was waiting for our space. You have to reverse into the road as there isn't room to turn round. We enjoyed our stay and will stay there again. The Lairgate Hotel did us proud hosting the Awards Dinner at the culmination of the Beverley Town Crier Competition. They didn't put a foot wrong, and the nods to Beverley's history, tastefully displayed, gave a characterful touch to the surroundings. 12 town criers and their consorts and guests from all over the United Kingdom were treated to a 3 course awards dinner. The food was excellent and the service during the evening from both dining room staff and bar staff could not be faulted. Friendly and enjoyable evening. "Wedding reception for 70 people"
Pre wedding arrangements disgust and commented on in a positive manor, layout, decoration, food. Gave us just what we wanted. On day, room was exceptional, silver buffet was far more than we expected, Staff organised the afternoon to the highest standard, looking after guests every need. "Partnership working at its best - Thank you!" The Lairgate Hotel were kind enough to allow us (The NHS) to use one of their beautiful rooms to run a group for older adults who have been diagnosed with dementia. The staff were kind, compassionate and helpful. They provided regular refreshments, looked after our clients and were able to assist us in the arrangements for our group's needs. Many of our group attended the hotel for lunch prior to our activities starting. They all commented on how lovely the food was and how excellent the service was. Many of them have agreed to continue to meet up at this venue. The hotel was quiet and in an ideal location close to the centre of Beverley. There were plenty of facilities and areas to relax in. The rooms were traditionally furnished and the whole hotel had a warm and welcoming atmosphere. I cannot thank Lairgate hotel enough for their kindness in allowing us to use their facilities. Our client feedback indicated that they all felt comfortable and looked after. They all reported they enjoyed visiting the hotel – as did we! This was our first stay at The Lairgate Hotel, although my wife and I have been to Beverley on several occasions and failed to notice it... despite it's central location. As it was market day, we had some difficulty in navigating our way to the hotel, so my first recommendation is to locate the hotel on an online map, then use Google Street View to rehearse your route. We arrived in the car park which is small but useful and free, and entered from the hotel's rear entrance. We were directed to our room, a double which overlooked the car park, and were immediately struck by the quaint stairway to our floor, which might prove tricky to anyone elderly or infirm, but not impossible. Our room was spacious, comfortable, warm and quiet. The bathroom had a bath with shower, and was well lit with a large window (with frosted glass). Many hotels these days seem to favour downlighters that only light a pool beneath them leaving you combing your hair in the shadows. We had a drink in the bar, and while the furnishings looked well used, they were clean and comfortable, and did not look out of place with the bar decor. Later in the evening when we returned from a walk, other guests commented about the comfort of the settees, and the service from the staff I mentioned that we arrived on market day, and The Lairgate could hardly be closer to the town centre, just a (one way) street away from the market place, and connected by a small passageway between the two, quaintly named "Narrow Racket".. narrow enough to be missed! Remember Street View is great for planning your visit. The Lairgate is not a modern boutique hotel, and while it could benefit from a repaint and fine tune - that could also destroy some of the character, and quaintness of the building and may also lead to higher prices, so my opinion should be viewed in the light of the price paid and overall satisfaction. My view is that we were sleeping in the room, not living in it, and it was better than adequate, and great value. The WiFi was great, both in our room, and in the bar, and was totally free. If you want a sterile clone hotel, at a budget price, stick to Premier Inns or Travelodge. The staff were helpful and polite on every encounter, and well dressed. We were the first ones down for breakfast on Sunday morning, and were attended to right away with tea and toast while our breakfast order was processed.. all of which was delicious. 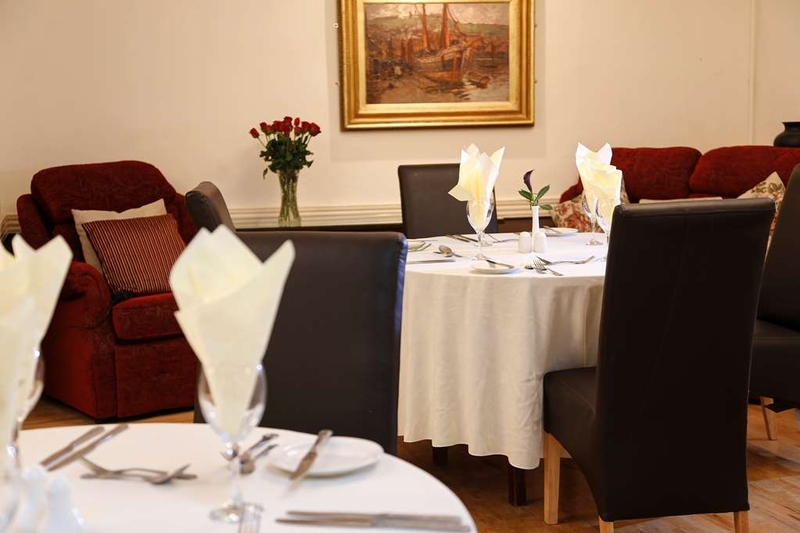 "Great staff but rooms need updating"
We stayed on 12th March following a function. All the staff were helpful and very keen to offer good service but our room dated back to the 70's! We couldn't decide whether the pattern on the wallpaper was dandelions or marijuana leaves but it was quite bizarre. Our room had bubblegum pink bedding, deep red dralon chairs, a very old, squeeky and uncomfortable mattress, a large pattern shade standard lamp and nothing in the room matched! The decor and furnishings in our room resembled a dodgy old folks home. Indeed one of our friends who also stayed commented that his 93 year old grandma had many of the same furnishings as he had in his room. We appreciate the hotel is very old and that is part of its charm but all the same, the rooms are well overdue an update. The bar area is nice and we wouldn't rule out staying there again but there is definitely room for improvement. "Nice rooms Shame about the food"
Attended as part of a large group. Starters were ok - main course was terrible though. Dry over cooked. One small dish of Veg for the whole table that too was cooked to within a inch of its life. Took ages to fetch more when we complained. By that time the meat was cold. Breakfast the next day was better. But expect much better for the prices they are charging. Staff were helpful and tried hard. But the meal really put us off. This was a very good experience, I went with my daughters for afternoon tea on Mothers Day. The food was exceptional, gorgeous crust less sandwiches with a variety of fillings, warm scones with plenty of butter,jam and cream on offer and a selection of cakes and the tea just kept on coming. The service was good too, I will certainly recommend and return. "Warm comfortable hotel, great murder mystery night." We stayed at the Lairgate at the end of February 2016. We were attending a Murder Mystery night event, purchased through Groupon. The hotel was warm and comfortable and the staff friendly. We enjoyed the food, which was hot and tasty and the portions were very generous. The Murder Mystery itself was great, with a strong cast of actors. It was a play within in play...a real mystery. Unfortunately there were a small number of guests who sought to make trouble and ruin the evening for everyone by disrupting the play and making a nuisance of themselves. The veracity of any review they might leave should be considered alongside the knowledge of the arrest of some of their number and the ejection of their entire group from the hotel. Well done to the wonderful hotel staff and actors for saving this night from disaster and keeping us all laughing. I have stayed here quiet a bit over the years with work, the service and staff is great. The food is good and the building itself is interesting to say the least. Ideally set close to the town centre it's a good place to stay and explore Beverly and the surrounding countryside. "Groupon Halloween Murder Mystery night "
Sad reflection of a Groupon deal. I received a lovely Christmas deal to attend a murder mystery at the Lairgate Beverley from my partner. We arrived I. Good time, some of the participants came in Halloween fancy dress and were excited at the prospect of a good whodunit. We sat down to find a plastic cover with evidence 1 written on the front of it. There was no direction from the cast of what to do. It turned out that the evening was geared around the promotion of the company running the night. The murder mystery clues where poor, and little information came from the actors. Now for the meal, as it was a whodunit with dinner.. The starter was orange duck pate with bread n bit of salad. Not to bad me thinks until the main meal. Bearing in mind we were sat on a table of eight strangers. we all received a meat pie dish with three roast potatoes. The plate and gravy was cold, and two couples at our table found blonde hair in their meals. One couple complained their meal was cold four times , duly the staff took their meals away and retuned them with extra gravy to try and warm the food! We could tell the food had been microwaved by the burnt gravy stain on the dinner plate. We got a tiny plate of veg ended up share between 10! By the time we had divvied the veg up there was nowt left when it came to us and no offer of more. All the participants on our table left the room and made a formal complaint to the manager. He told us to make a complaint to Groupon but made no offer of reckon pence for the poor service or meal. The sad fact was that I am local to the area and was hoped for a great night especially when a lot of people had travelled from far and wide just to spend time in Beverley. I have previously attended two wedding receptions at the Lairgate which were great. However, the Murder Mystery night was rubbish ! How sad as there was over 120 people present with a potential of future business. This is a sad reflection of poor business management trying to do things on the cheap when drinks were expensive! Lovely hotel . Staff very friendly . Car park small but as weekend can park in council car park with no charge . The food we had upto desert was ok for group booking (80 persons ) . However the murder mystery became a farce as people complained and left . Police where called so best foot forward leave & go to pub nearby . Advise hotel good forget their murder mystery nights !! This is a must for anyone visiting Beverly for a few days. The staff are friendly cheerful and always ready to help. The hotel is spotless and is ideally placed so that once you have parked it is only a very short walk to the town centre. We had an afternoon tea on the Saturday that could only be described as superb we thought that it was meant for three there was so much we certainly had nothing else to eat that day. Be advised that if you have trouble with steps there are some ground floor rooms available but you must book these in advance. I would definitely book this hotel again and have no problems reccomending it. We only stayed 1 night and we wished we could have stayed longer. We stayed in room 1 which had a lovely 4 poster bed and this was so comfortable. The room was huge with a really large bathroom as well. The staff were really friendly. It is situated right in the middle of Beverley but we had no noise. Yes the place has a bit of an air of faided grandure but we only paid £68 for B&B. The breakfast spread was great but my only comment was the cooked breakfast which was poor really but for the money I am not complaining. Excellent night, we didn't know what to expect really as we had never been to one of these nights before and didn't have a clue how it was going to be run. all guests were seated on round tables that fit 10 people, wasn't to sure about this at the start but we got a great table with really nice people on it some who were quite local and others staying at the hotel. the meal was served as the cast walked around the room acting out the murder mystery night while each wandering to each table where they had a chat with us (in character) and gave away various clues, it lasted till about 10.30pm where you then fill in a sheet saying who you think had done it and why. Really well organised and bar open till late afterwards. Hotel was lovely, very character filled and fitted in well with the Miss Marple type night. same for our room (1) which had big 4 poster bed and many nice features and spotlessly clean. the staff were very friendly and helpful. "Very Dated Back to the 80's"
Stayed for one night in early February for a winter break. There is a small car park which was good and the location is excellent just off the market place. Very friendly member of staff checked us in and showed us the room. The room was very dated and very "green" from the wallpaper to the towels in the bathroom. The bed was very low and very soft and only two pillows. The TV was in an awkward position to the right of the bed which made it difficult to watch. It would be better positioned directly opposite the bed between the two windows. But it is a period building so this may not have been possible. On the plus side it was clean and the bathroom was fine. Shame about the shower curtain rather than a screen as this usually means a fight with the curtain trying to cling to you. But for one night we were fine. Breakfast was really good the next morning with the cooked breakfast cooked to order along with toast/coffee. The only gripe would be the cereal was in large bowls left uncovered which put us off having cereal to start with. Overall the stay was ok and we would stay again but perhaps ask if there was an updated room. stayed on a last minute booking and got a half price deal. Usual Best Western class and charm . An old hotel with character. Breakfast was very nice and plentyfull, Easy access car park and in middle of the town .. had a lovely night. So far my stay has been great, room cleaned everyday, the staff are lovely. The food is amazing as I highly recommend eating in at least once, If not more! Kudos to the chefs. the style and location of the building is wonderful, and at such an affordable price. Just off the centre and not far away from the train station, so there is no need for taxis, unless the weather turns.. Overall I would give this stay a 10/10. Also to add, if your a WIFI user, its brilliant here and free!! I usually stay at the main chains but limited choice in the Beverley area. Booked the Lairgate through Kaligo (so still got 400 Avios) . Friendly staff ,Lovely big room and nice breakfast. Free car parking, a regular in the area now so will return. We had a lovely stay at the Lairgate Hotel. We were given the Honeymoon Suite, which was stunning, with high ceilings and a four-poster bed. The staff was welcoming and helpful and the breakfast was excellent. Would recommend the hotel to anyone. overall the hotel was ok. very convenient for Beverley Town Centre. Felt staff were pre-occupied with Christmas parties held at lunchtime, failing to give residents due attention. Breakfast was not up to the usual standard of Best Western Hotels. My husband and I stayed overnight for the murder mystery evening which was Xmas themed and I thought it would be a nice treat leading up to Christmas, although we did not know what to expect. We did not need worry because from arriving to the hotel we got a very warm welcome, a large comfortable room, great food/drink, that was served with a smile, we thoroughly enjoyed ourselves. I would recommend the evening it was so entertaining. Unfortunately my husband left his watch. A quick email was sent to the hotel and the watch was sent via post a couple of days later which we really really appreciated. Nothing was any trouble. We booked to have our Christmas party here on Friday 11th December for a large group of people, the hotel called us on the 7th December to cancel as another group had dropped out. This is terrible behaviour as our whole party was about to be ruined. It's a good job another hotel near by could squeeze us in. I would never recommend anyone to book an event here as they are too unreliable and you are likely to be left disappointed! Stayed at the Lairgate for 1 night and had a great time. We stayed in room one, which was absolutely massive and had a four poster bed. The bed and furniture were quite low, which was a bit inconvenient, but could be a problem for some. Hotel was clean and tidy although parts could do with a bit of upgrading. Staff were all very good. All were happy, helpful and very friendly. Free wifi was excellent. Breakfast was lovely, and had everything we wanted. Again served by great staff. I would recommend this hotel to anyone. "Friendly helpful staff and surprisingly good food"
My partner and two friends booked the hotel for a murder mystery event. Despite the hotel being full, the staff without exceoption were friendly, helpful and cheerful. The package included a 3 course meal and breakfast - both of which were excellent - both in terms of value and quality. Despite only paying the set amount our room was a revelation - with Chinese carpets, a four poster and a chaise longue, good selection of teas, coffees and quality toiletries. The bath towels really were - and plentiful. The only drawback was parking. The hotel - being right in the middle of Beverley has limited parking, and the on-street parking regulations were very obscure. However, there is a pay for car park 30 yards from the hotel - but if you are not used to Beverley - you can end up driving round a long loop in the one way system. Best advice? Trust your sat nav. We had a great time and would recommend both the hotel and the Murder Myster events. Second stay at the Lairgate, which doesn't sell itself as a boutique hotel, which is fine. It's an old building full of character and with friendly, helpful staff. This time I had a front facing room but there isn't much traffic and it didn't disturb me. the room is clean, warm and comfy and the bathroom, although shabby and pink, is also clean and warm. The shower is new and powerful and i am more than happy to stay here again. My mother and stayed for one night at the lairgate hotel and what a treat is was. From entering the building every staff member was friendly happy and could not do enough for us. We had an executive twin room and it was very warm and cosy and clean. Breakfast was served with a smile and delicious. Couldn't fault it and can't wait to go back there. "Excellent service that went the extra mile"
We stayed at the lairgate for a long weekend at the end of October 2015. The hotel went the extra mile and got my family and I into one large room in the annex. The room itself had comfortable beds and was clean but the bathroom needed work - the shower rail could hold one towel and we were 5 (2 adults, 3 kids - 12,10,3) and the shower curtain was inadequate. The shower rail was also coming off the wall which was a little dangerous. Nevertheless the room was fine and not too cramped even with an extra bed. A big thanks. At night however the room was noisy with creaky floorboards from the room above. The people in this room were early risers getting up around 6.00 am. You really had a lot of banging and creaking which is hugely irritating. The hotel itself in the main building is very nice. A Georgian mansion really. However the levels of service and general quality is friendly rather than professional. Breakfast was very average. We ordered boiled eggs and soldiers for my daughter on one day and the eggs came back hard boiled. The next day she ordered poached eggs and she got one egg not two as the chef had miscounted! To be fair the guy offered to bring an extra egg later but by that time it was too late. No water bottles anywhere either in the rooms or at breakfast - just sugary drinks. I'm currently listening to the sounds of the room above showering. Not great. There is a car park which is helpful and if you are in the annexe you are part of. just had an overnight stay,firstly the main photo on tripadvisor is of the back of the car park,don,t know why???? does not do the hotel justice.the hotel itself is very traditional,lovely lounge etc,, we stayed in room 4, which was spacious,had everything we needed even an ironing board and iron and one of the most comfortable beds we,ve slept in.The decor is a little dated,but it was immaculately clean.we had afternoon tea,which was lovely.excellent location,right in the center of beverly,the staff were very friendly,would stay there again . 17th of October found us going to the wedding reception of my niece at the hotel. The manager had provided us with a parking space as we needed access to the car throughout the afternoon. When entering the establishment it was obvious that the place was clean, tidy and cheerful. The bar was small but was run efficiently. There was not a great choice of beers and lagers but there were sufficient and they stocked non-alcoholic lager in bottles.There were no real ales but then such a small establishment would have had a deal of wastage as they need a good turnover. The food for the afternoon was a buffet which was very pleasantly presented and the food was of a very good standard and there was plenty of it. As we didn't stay overnight I cannot comment on the rooms or other facilities. However if the standard of them lives up to my short experience, they will be of a good standard. On arrival the check in procedure was very efficient with "Tom", who also showed us to our room, I had asked for a quiet room, and we were not disappointed. We were on the top floor and it was lovely and quiet. The room was also large with a large tv and the usual tea coffee making items. We went for a walk in the town of Beverley, which is one minute away and was very enjoyable. We then had high tea in the hotel, This was very good indeed both in the way it was presented, and the quality and quantity. We had a very quiet night in our bedroom, and slept well. Breakfast was very good, and was most enjoyable, the one waiter worked very hard and nobody appeared to have to wait long for their food. All things considered this was a lovely experience and I would happily stay again. "Friendly Staff, clean but inconsistent rooms." Stayed here for work with a colleague. Hotel was cleaned and obviously looked after. The staff were friendly. Breakfast was painfully slow and not one of the people around me had gotten what they had ordered. Rooms are functional but tired (chairs evidently very old but not in the antique way). With two rooms booked a day apart two very different rooms were obtained. One very large well appointed and comfortable room and one tired cramped and unwelcoming room(mine). We had a faultless experience from the the first moment we walked in to The Lairgate hotel when we started looking for reception venues. The hotel is lovely with real old world charm and class, the staff were welcoming friendly and helpful, our room was delightful, the buffet was excellent as were our breakfasts. We would both recommend The Lairgate for any function or as a fantastic place to stay right in the centre of Beverley we could not of chosen a better venue. "High Praise For Staff service"
We booked in to the Best Western on Lairgate Beverley for two nights for our annual visit to the races. This is the first time we have stayed in this hotel, the car park is only small but there is a pay and display nearby. The rooms are clean and tidy and very quiet and the bar area and dining room are both comfortable. What makes this hotel stand out is the staff!! It is not often you can say that about an establishment, you can compliment it and praise the staff accordingly but here they were pleasant and always smiling, they were attentive and would do anything for you they made the difference between a Good hotel and a Very good hotel. For the price as well you cannot go wrong, we will definitely be back next year. "Poor service and shabby rooms "
We stayed here for the weekend visiting friends. We couldn't find anyone on reception so had to wait for the staff to turn up. Shown to our room in the old side of the hotel. Very dated and worn. Terrible mattress and grubby room. Management didn't want to know. They have no idea how to run this hotel and don't want anyone to tell them otherwise. I would never stay here again. Old world charm in the heart of historic and charming Beverley. The tea started with a glass of something bubbly and alcoholic, with strawberries! Finger sandwiches : egg, tuna, cheese, ham and slice of quiche- yummy! small meringues, choc brownies and choc sponges. Followed by scones with jam and cream. Tea or coffee in plentiful supply throughout. Staff as charming as the surroundings! PG TIPS cuppa club doing an offer 2 for 1 at the moment so it was £4.50 each - ridiculous! The offer finishes soon though and you need to collect points. Still great value at full price.